So I’m officially 3 calendar months into my trip and have completed less walking and more bus riding than I was anticipating. I am still achieving my aim of seeing the coastal parts of the country although it does seem to be getting more difficult in many ways further North. After the miserable weather the preceding 3 weeks, this week has been much better (except for Saturday morning) and we even had a heatwave! 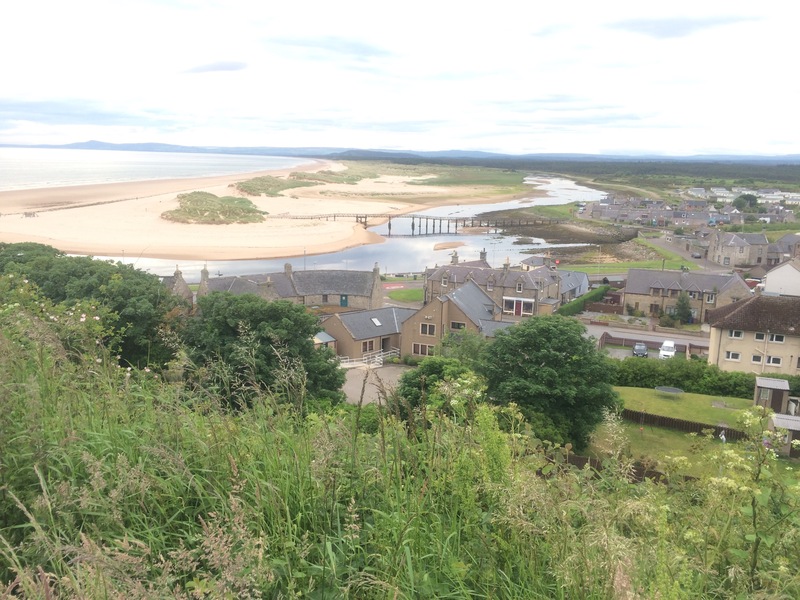 Some of the coastline, particularly around Lossiemouth, is wonderful. 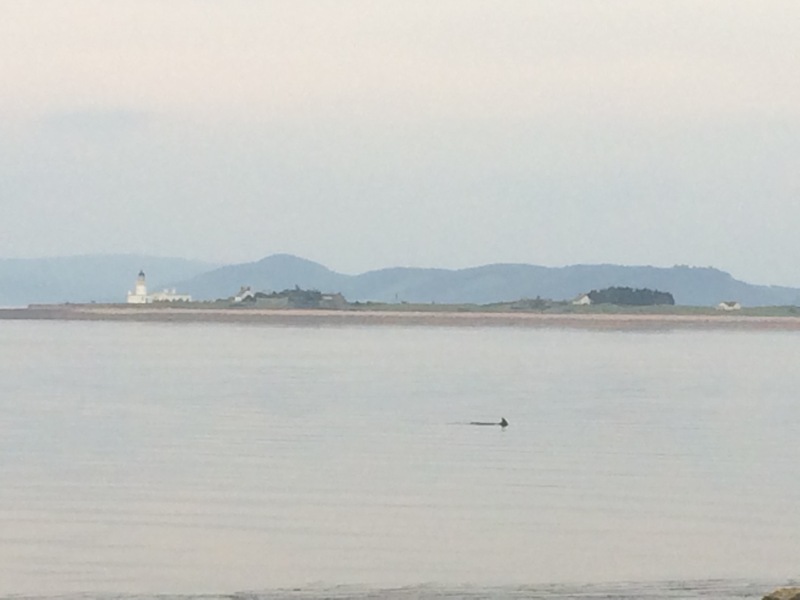 Not so much wildlife this week but plenty of Moray Firth dolphins; I was treated to two sightings this week. It was great to be hosted by Dave and Cally, who looked after me well and sheltered me from the heatwave. 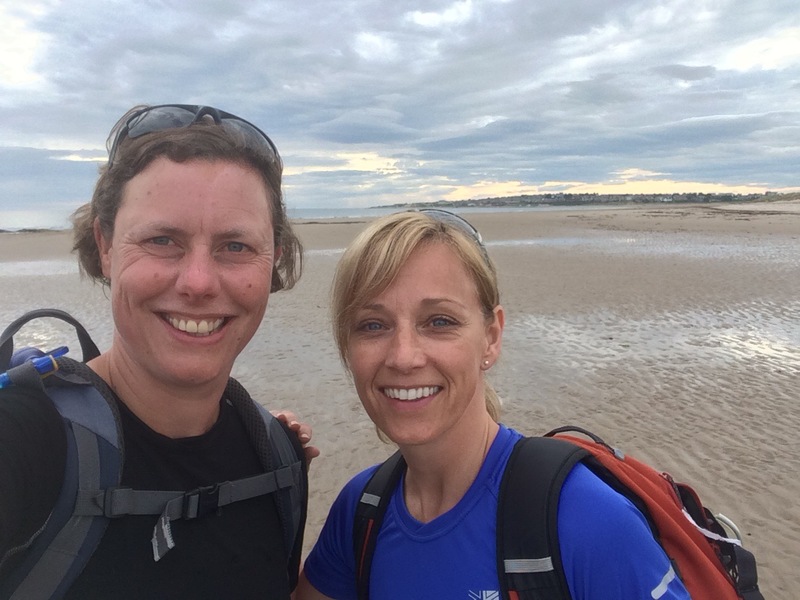 I am pleased that I inspired Cally and her daughter to wild camp on Friday; they got to go home before Saturday’s rain arrived! I have been a little surprised by the prices this far North. I was expecting a bit of a North-South divide but I have found accommodation and meals out cost the same, or more, than at home. The difference is the volume of restaurants and pubs, of which there are a lot fewer than down South. I have been surprised by the distinct lack of pubs. Not every town has one and, if they do, they can look more like drinking dens (often with no windows) than the sorts of pubs I’m used to. Many of them don’t sell beer either, only lager. As the Nigg Ferry wasn’t running I was going to have to walk inland to the A9 road crossing of the Cromarty Firth in order to leave the Black Isle and head North into Easter Ross. After a big breakfast I set off alongside Cromarty Bay. This was to be a day of road walking. It was a grey but warm day; not great visibility for views. 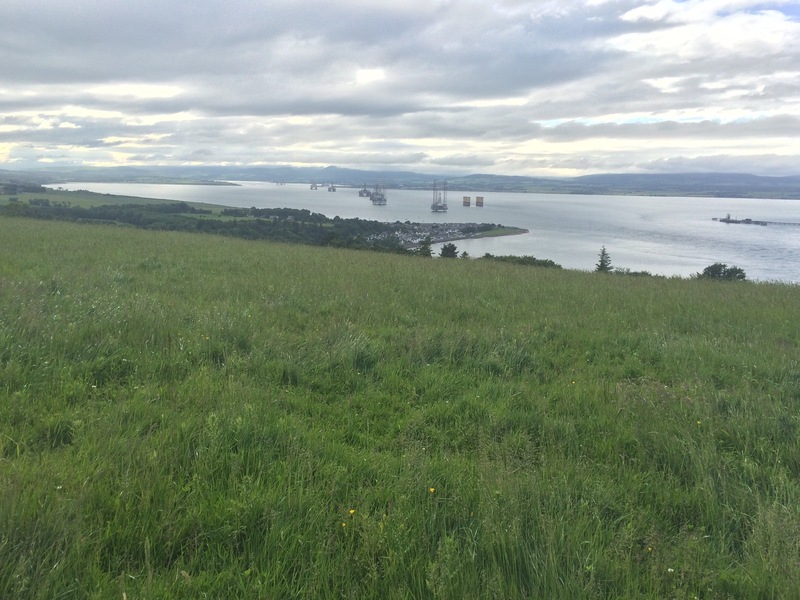 The deep water of the Cromarty Firth was used by the Royal Navy for over 300 years, including as a harbour for the Atlantic Fleet during WW2. When the Navy left in the 1950s it left behind the oil fuel depot and the oil industry moved in. 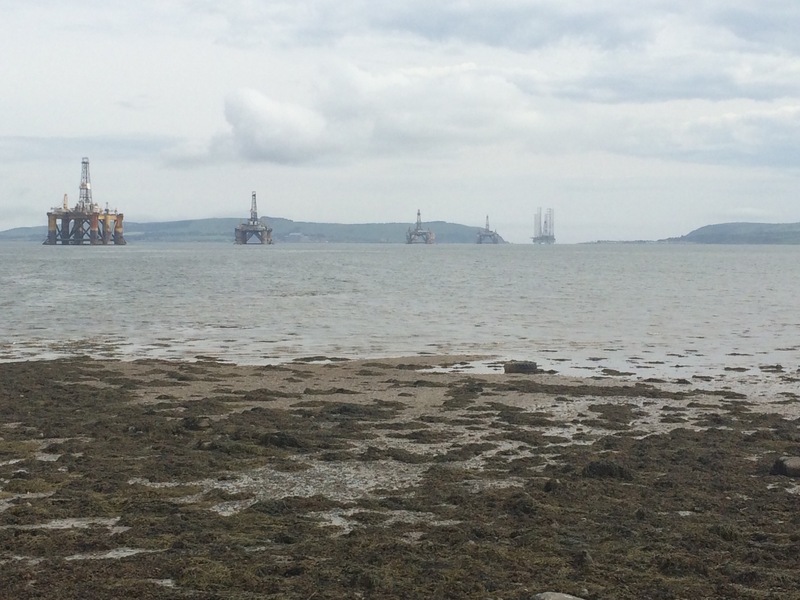 The Nigg Fabrication Yard and oil terminal were right in the eyeline from Cromarty, and then there were the 8 oil rigs that were in the Firth at the moment. 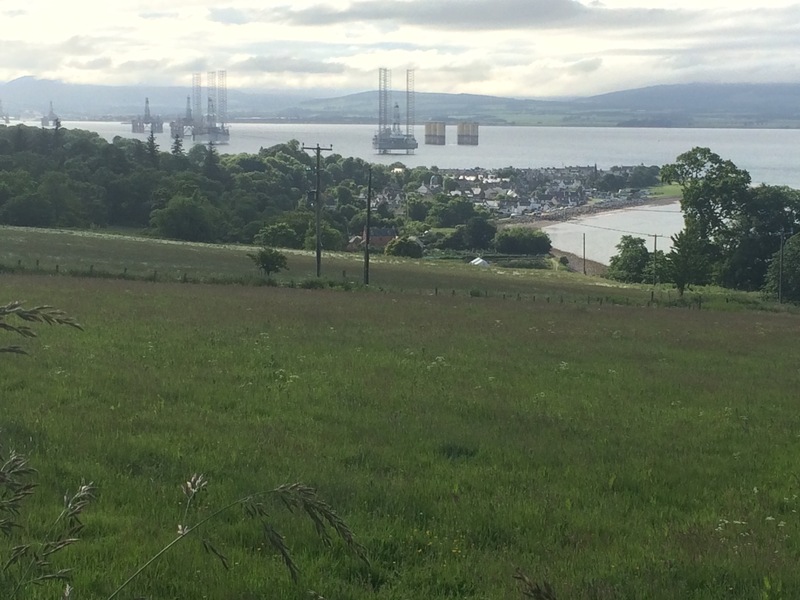 Invergordon is the hub for rig repairs so rigs are often laid up in the Cromarty Firth (they might also be surplus rigs as production is cut back) and they really dominate the surroundings. 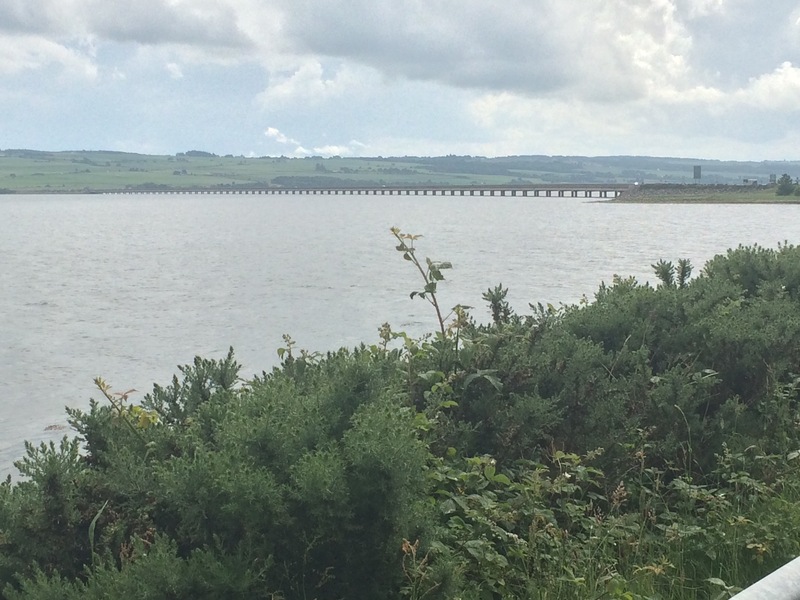 I walked around the Udale RSPB Reserve to Newhall Point, right opposite Invergordon at another ‘neck’ in the Firth. 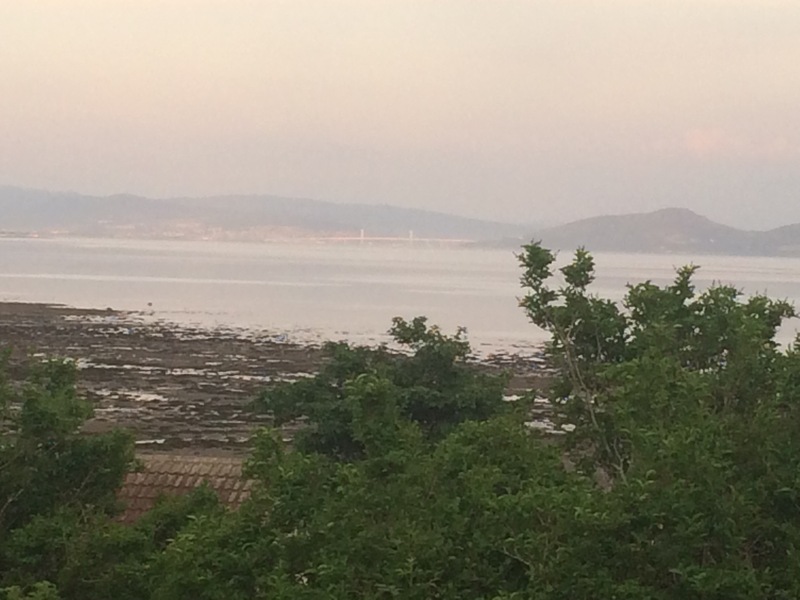 Here I had a break to tend to my first blister since Norfolk and to look at the oil rigs. 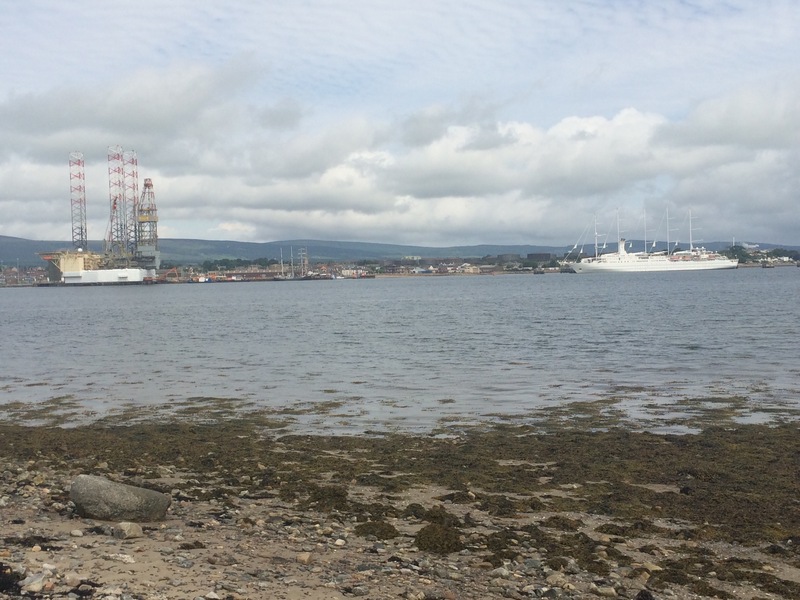 Invergordon is also a cruise liner port; a big one left last night and there was only a small one docked today. I walked to the rundown Balblair pier hoping to find a path that was indicated on the map. Some ship workers soon put me straight that there wasn’t a path and I was forced back up the hill onto the road for a 7 mile trek to the bridge. After about 3 miles with cars dodging me I finally plucked up the courage to thumb a lift and I got lucky as the first car stopped. A very nice lady gave me a lift to the A9, saving me 4 boring miles. 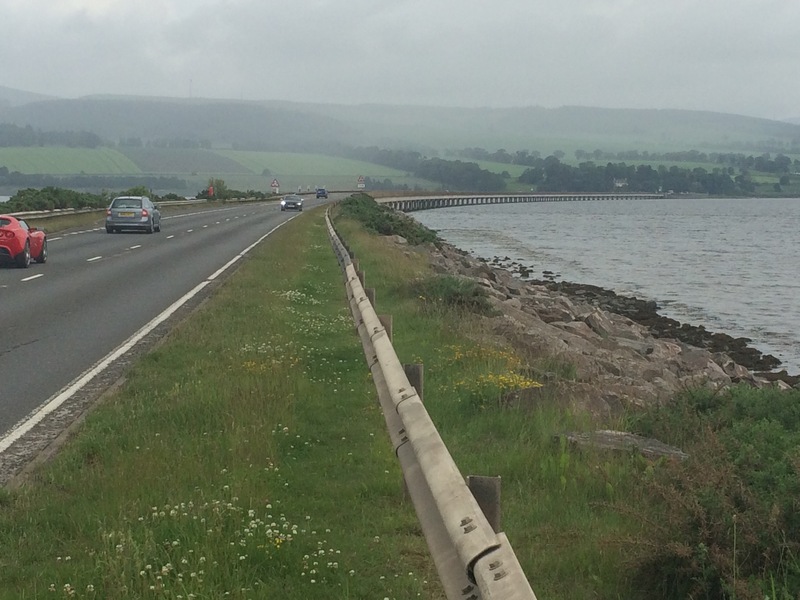 The next bit was to cross the A9 bridge, which was not the most pleasant experience. There was only a small pavement alongside a very busy main road. I was fortunate only 1 lorry went past. 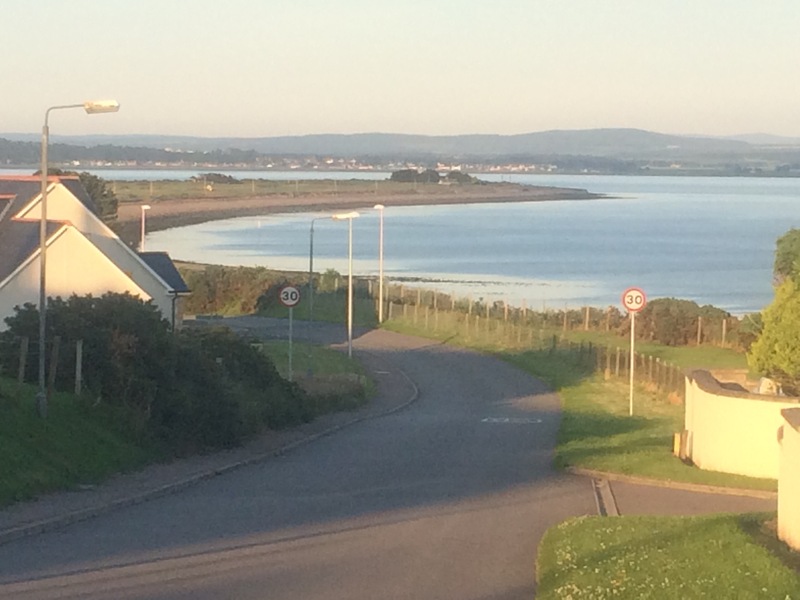 I had to continue for another 2 miles along the verge of the A9, right beside the North side of the Cromarty Firth, until I got to the Foulis Point Heritage Centre. I stopped here for a break and just sat on a sofa in the busy restaurant and read a newspaper. No one bothered me even though I didn’t buy anything. I only had 2 more miles along minor roads into Evanton. I was the only one staying in the bunkhouse at the campsite, but I was glad to be inside when the heavy rain arrived later in the evening. What a difference a day makes. I knew rain was forecast so I got up early to try and get my tent down before it started; 5.15 am was not early enough! 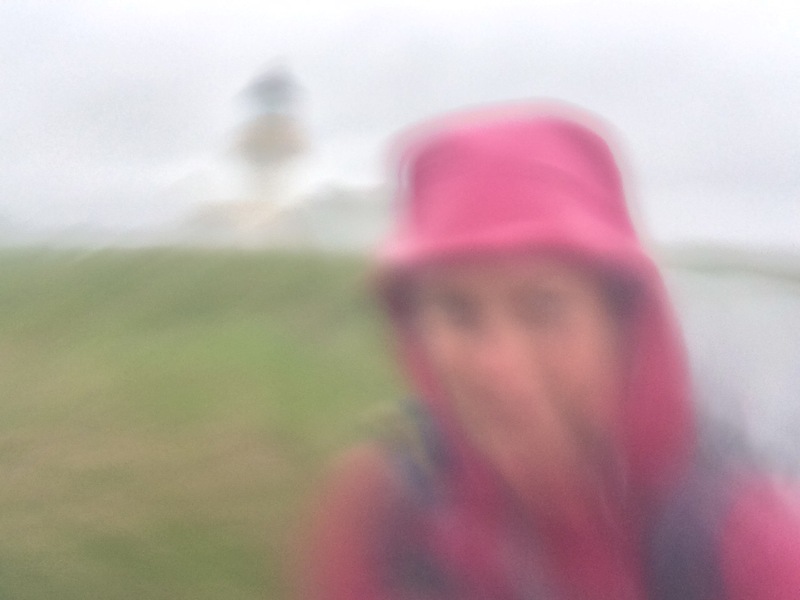 The sky was very black and I had only just managed to pack away my sleeping bag and mat when it started raining. I got back in my tent for a bit contemplating my next move; I decided that I would have to pack the tent away wet, so that’s what I did as soon as it eased off a bit. I was away by 7.30 and immediately I started walking the rain became heavier. I walked down to Chanonry Point but there were no dolphins to watch this morning and no people out trying to catch a glimpse. I could barely see across the narrow stretch of water to Fort George. 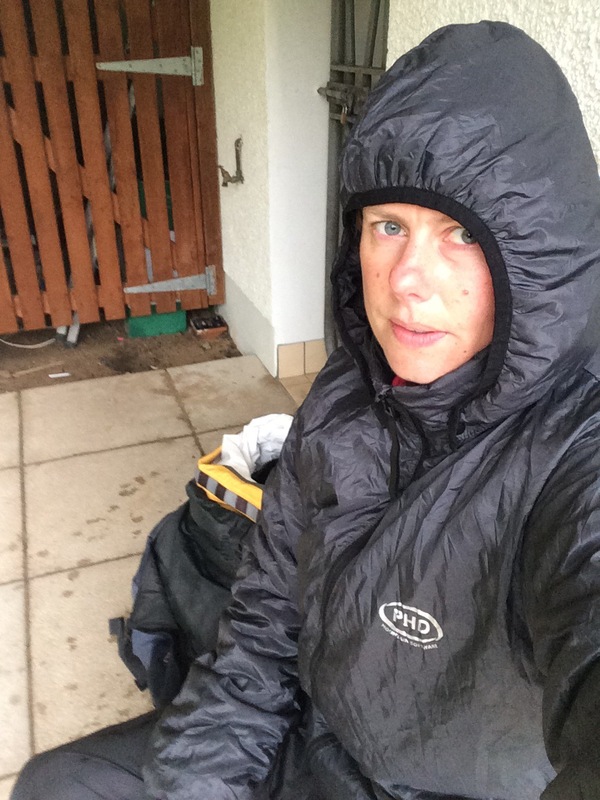 By 8.30 I was soaked through to my skin and starting to get cold. I stopped in the Spar at Rosemarkie and they advised me there was some shelter down by the beach cafe, although the cafe didn’t open until 10.30. 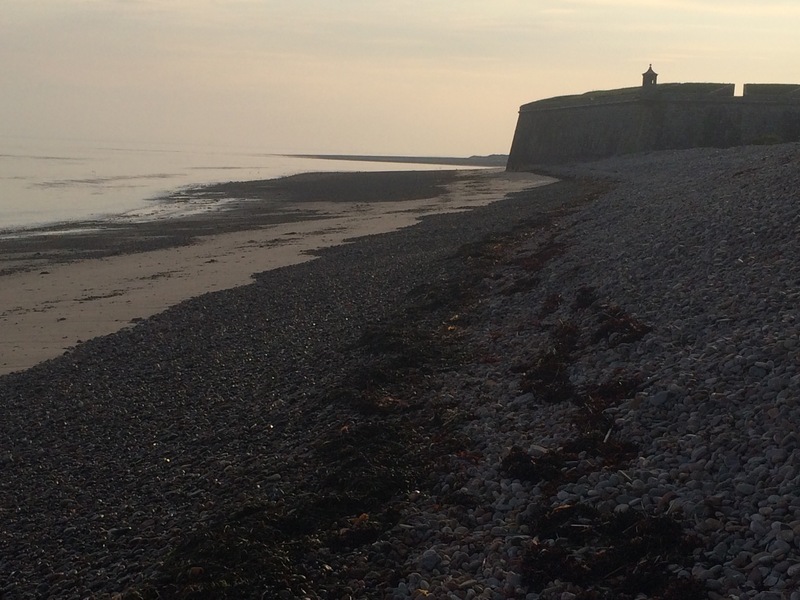 I was heading to the beach anyway as the path to Cromarty ran along the shoreline but was only accessible at low tide. Looking at the high cliffs I decided it would be foolhardy to take the path in the driving rain as it involved scrambling across rocks and beating the tide. I sat outside the cafe for an hour and a half, sheltering from the wind and rain. I had to put several layers on, including my coat. Sheltering outside the men’s toilet behind the closed cafe – all the best places! At 10.30 the cafe opened and I could shelter inside with a coffee and a bacon sandwich. A little warmer I headed back out to walk down the beach to look at the amazing rocks that are different to the sandstone that is everywhere else on Black Isle. 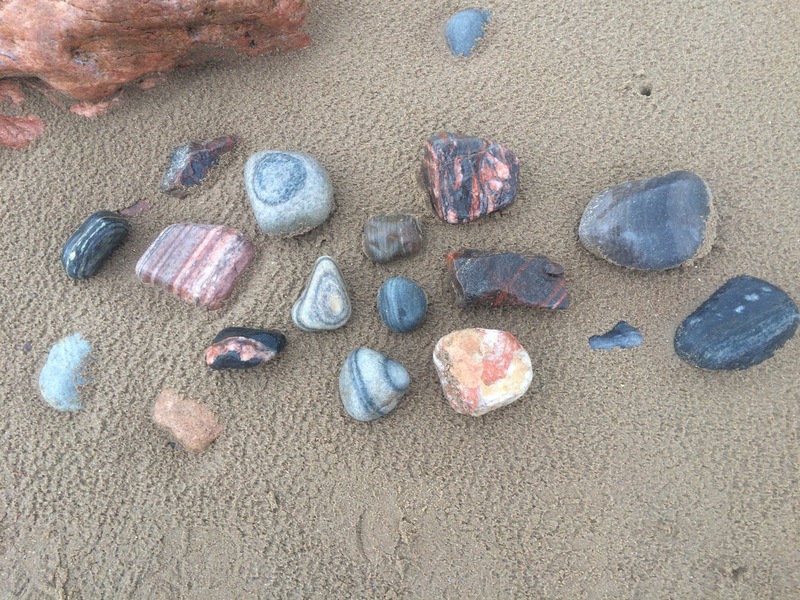 Apparently the rocks here have been pushed up from the Great Glen at some point. Many are rather striking. 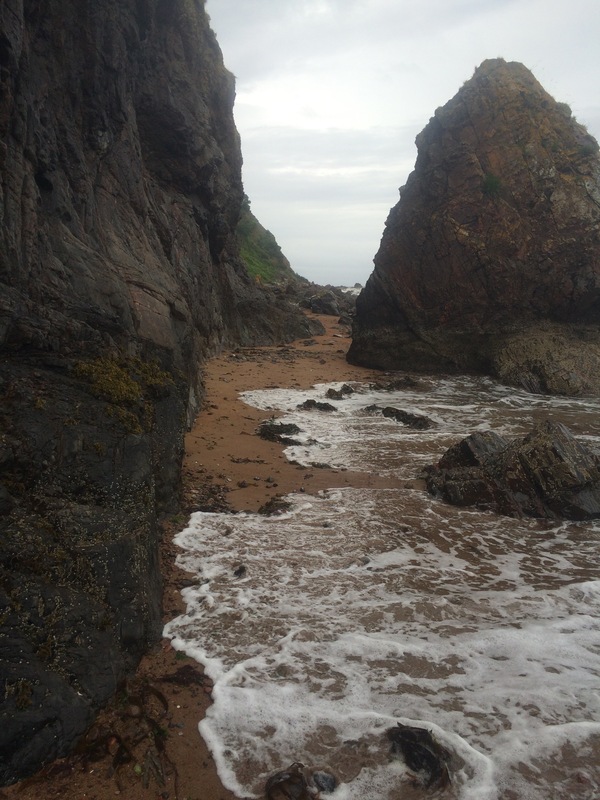 The sea was already at the base of the cliffs so there was no way I could walk the path to Cromarty. 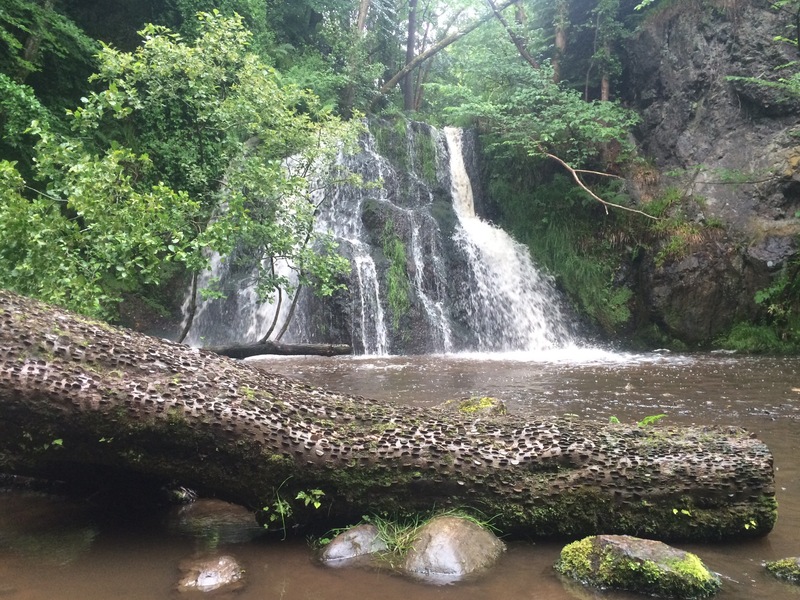 I could walk the roads, but instead I chose to take a walk up the Fairy Glen to the waterfalls that are supposedly where some fairies live. The waterfalls were indeed spectacular and were worth the walk up the muddy gorge. 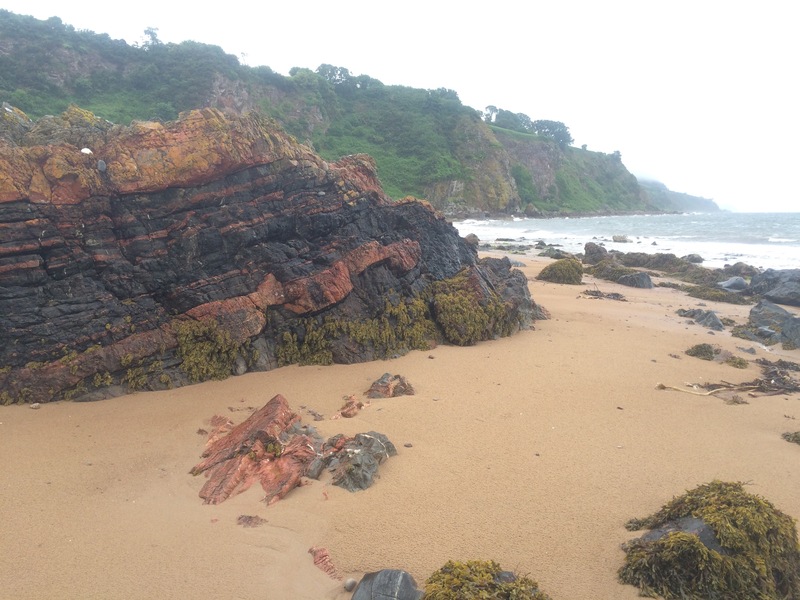 Back in Rosemarkie the rain was easing off but I was still soaked and wearing 5 layers of clothes. 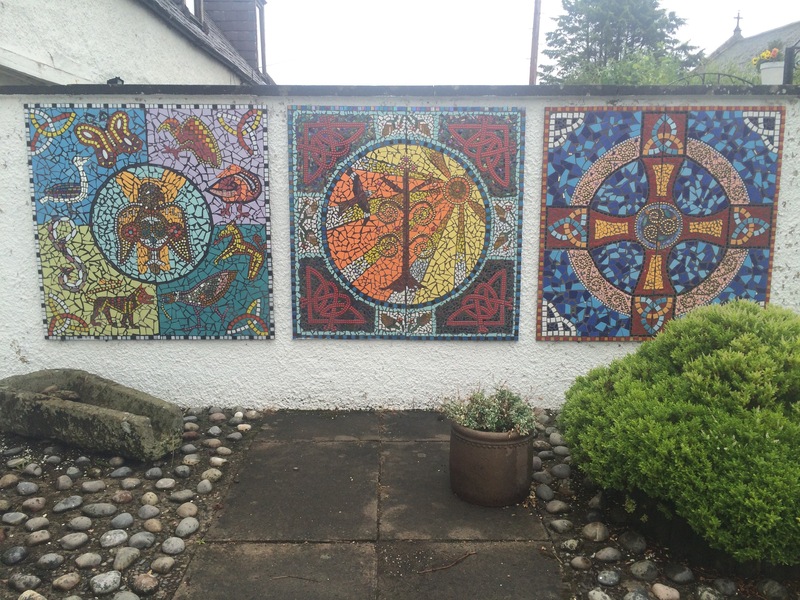 I waited for the Pictish museum to open at 2 pm (seriously, nothing is ever open this far North) and went for a look around before getting the bus to Cromarty. 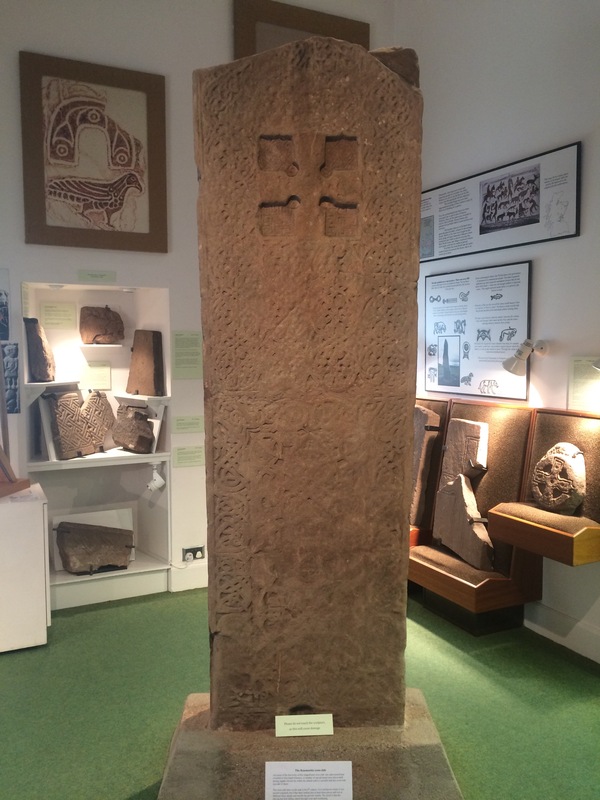 The museum contains a beautiful cross slab from 8th Century Pictland and I learnt a bit about the Picts, who were farmers in East Scotland. 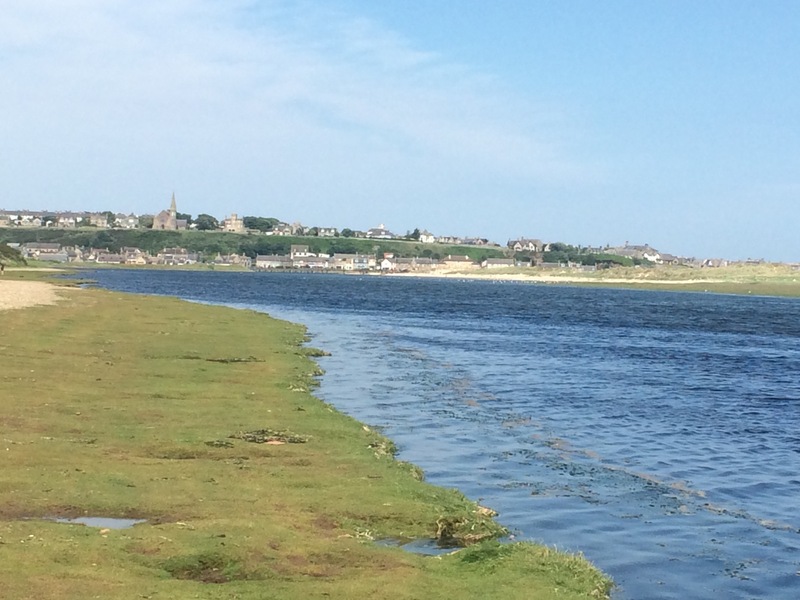 This area has a tie with Lindisfarne as St Columba came here in the 6th Century from Iona to spread Christianity. 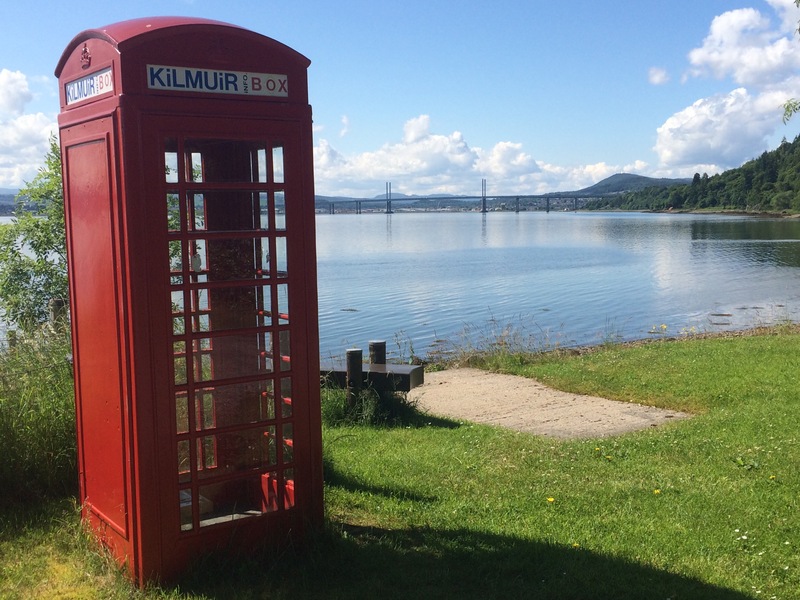 Cromarty is a lovely town built on a small protrusion of land at the neck of the Cromarty Firth. 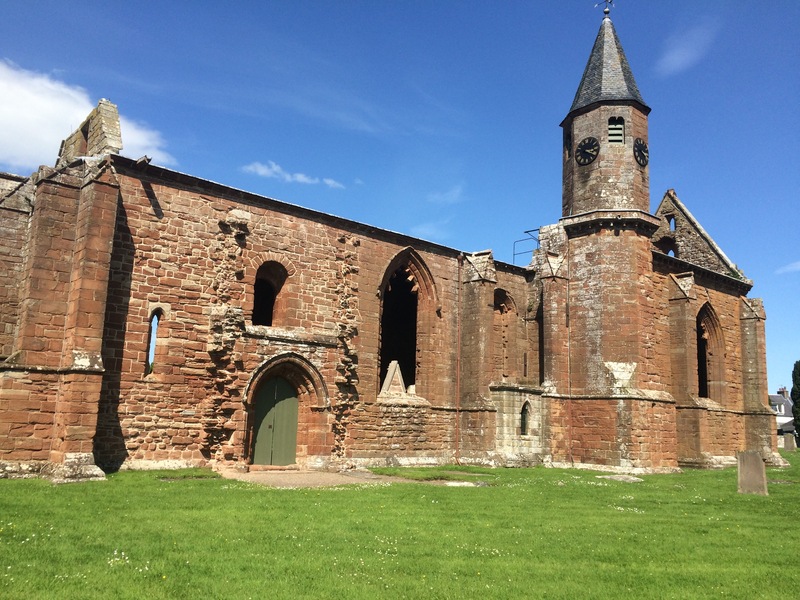 It was on the Medieval pilgrims’ route heading North to the Shrine of St Duthac at Tain; the ferry between Cromarty and Nigg being a constant feature since then…at least until now. 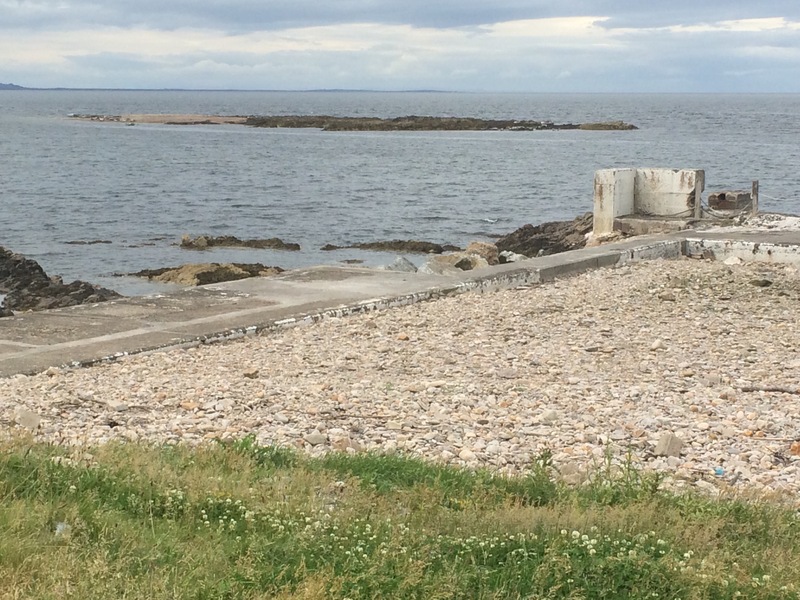 Unfortunately the ferry has been cancelled this year until repair work is carried out on the Nigg landing area. I had intended to get that ferry! I even tried the local harbour pub to see if any fishermen could take me but no joy. Cromarty has retained many of its fine old buildings from the 18th and 19th Century and it’s good looks draw in the tourists. 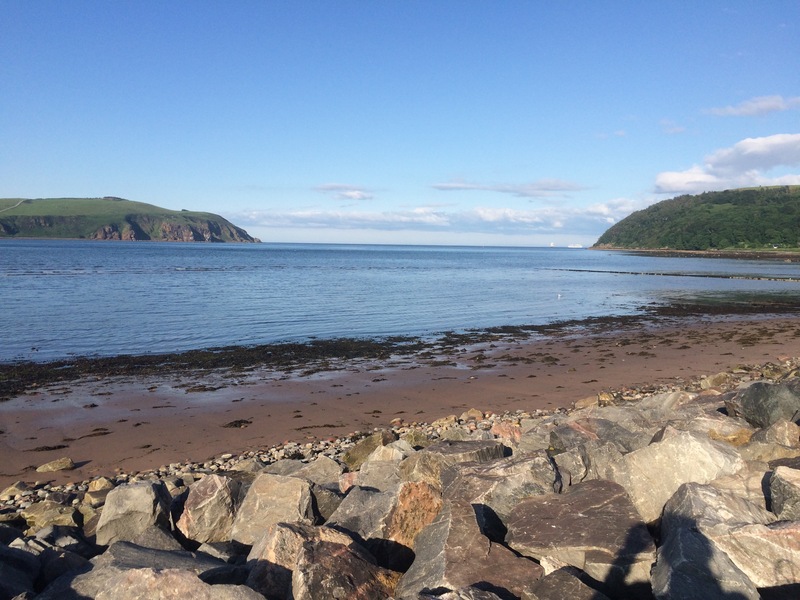 It was the birthplace of Hugh Millar, who taught himself geology and discovered a fossilised Pterichthys (winged fish) in the old red sandstone on the Cromarty foreshore in 1830. 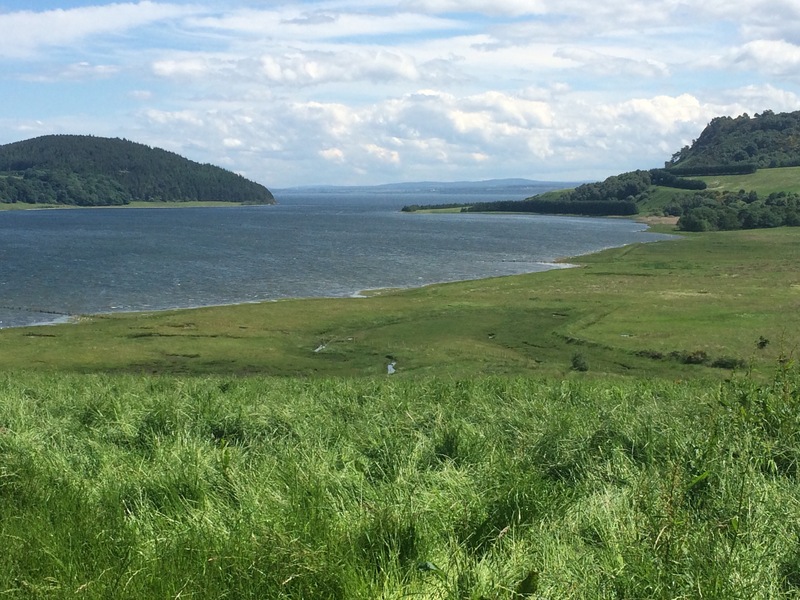 The Cromarty Firth is protected by the North and South Sutors (hills either side of the Firth entrance). Sutor means shoemaker in Scots and Legend has it that 2 giants used the Sutors for workbenches. As the clouds broke in the late afternoon I walked up to the top of South Sutor to admire the view; I could see right across the Moray Firth as well as back inland. 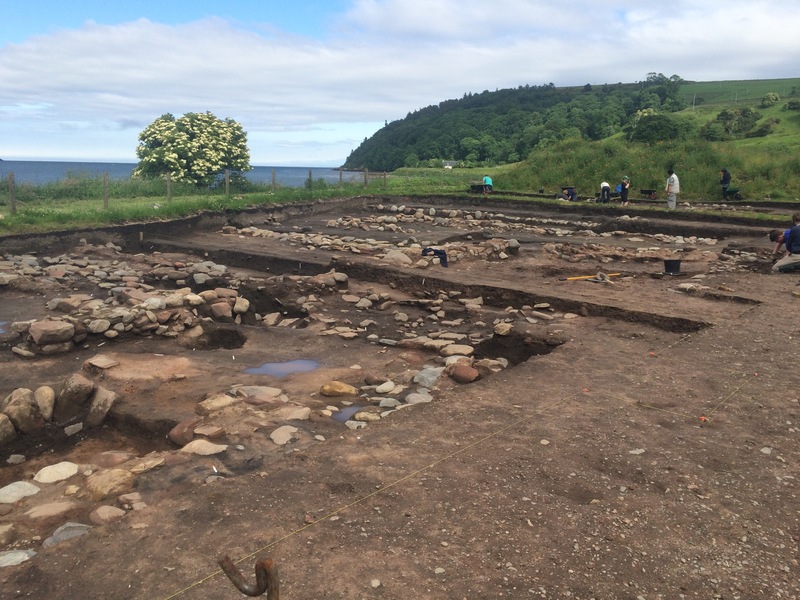 On the way out of Cromarty I stopped to take a look at the Cromarty Community Archaeology Project that is excavating a medieval burgh. The Cromarty Arms was rather quiet early evening as there was a fiddle concert in the old East Church (part of the Black Isle Fiddlers Weekend!) so I think lots of people had gone to that. Sadly it was sold out and I didn’t have the energy to wait and see if they came into the pub for last orders. I was up early as it was so hot and the man in the bunk next to mine (mixed rooms these days!) snored like a train. 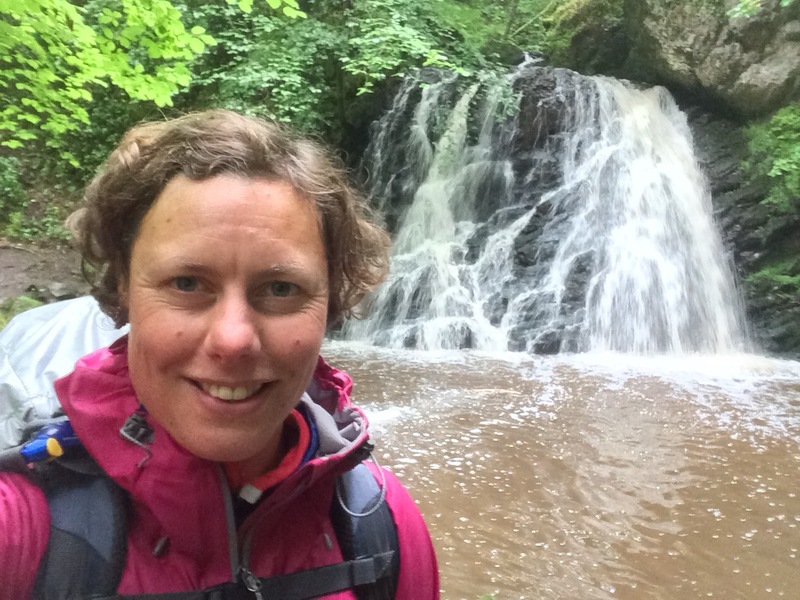 I took some time to catch up on the blog and then headed out for a quick breakfast in town on the way to the Kessock Bridge. Unfortunately the cycle route by the River Ness was shut owing to work being carried out so I was relegated to the footpath by the side of the main roads through an industrial park. 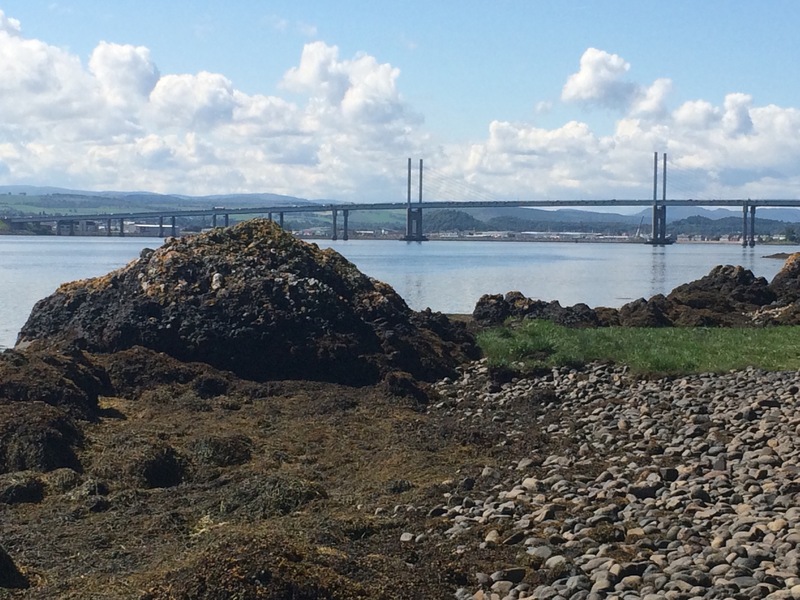 The Kessock Bridge crosses the narrow section of water that splits the Beauly Firth from the Moray Firth. It was opened in 1982 by the Queen Mother and looks like a modern bridge. The views up the river into the mountains were great and some of the mountains still had snow on them. 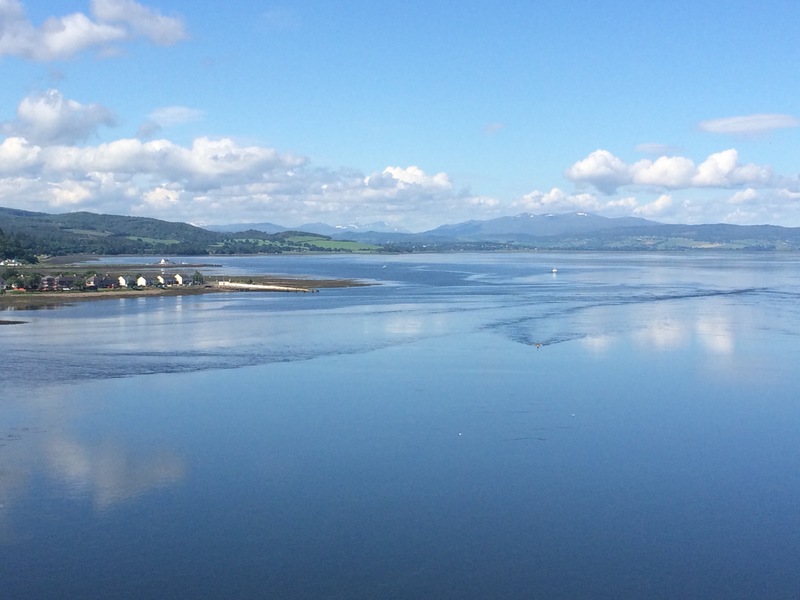 What a view of Beauly Firth, and those mountains have snow on them! Once over the bridge I was in the Black Isle and the countryside. 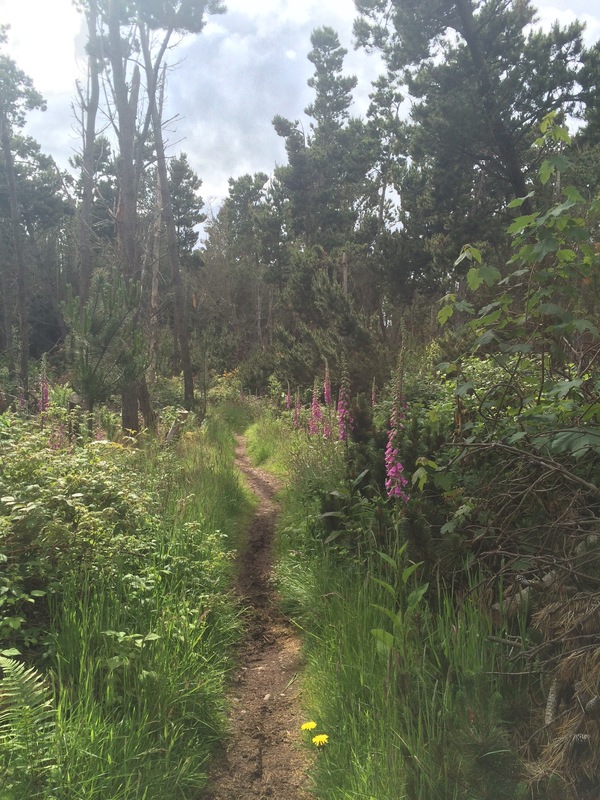 Initially there was a road and then a path (sort of) along the side of the Moray Firth to Kilmuir. Just after this village the path disappeared and I found myself negotiating a steep hillside covered in gorse and ferns. It was incredibly frustrating as the map said there should be a path and the tracks I found kept leading to nowhere. I was going up and down the same hillside constantly being trapped. At one point I found 2 enormous houses with a road/track that linked them, but no matter where I looked I could not find the road out. Ridiculous. Perhaps the owners arrive by helicopter? Eventually I made it out to a minor road and then on tracks down to a large inlet called Munlochy Bay. Again the tracks were fading on me as it looks like no one drives down them so they become blocked with gorse and nettles. I made it into a field that was obviously used by cows and was also quite boggy. Wading through a boggy cowpat is quite slow going and I was glad I didn’t see any cows. I finally made it to the main road, which was almost worse as it was rather busy and narrow and there wasn’t a pavement so the cars had to move out to avoid me. 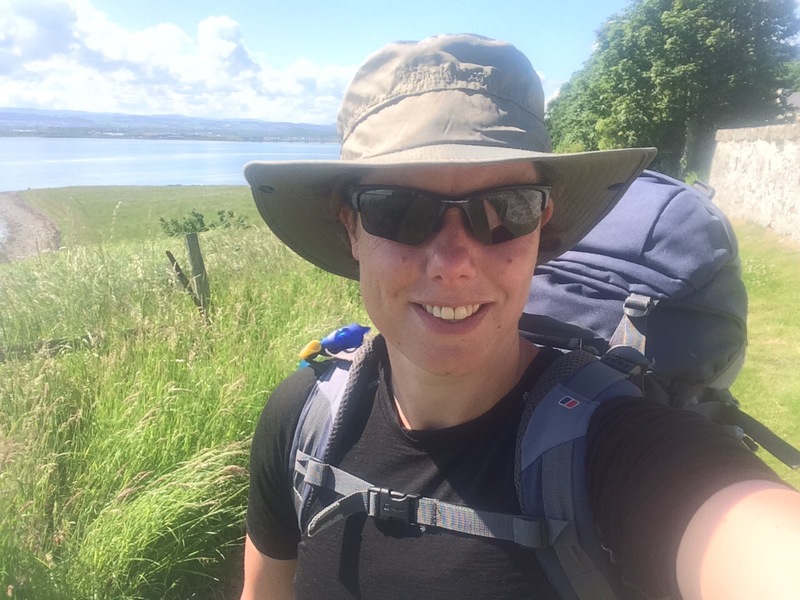 By the time I got to Munlochy it was 2.15 pm and I needed a break as the weather was very hot and sunny (I was glad of that hat!). I stopped at the first pub I came to and sat inside to cool down. The barman kept topping up my soft drink as I looked like I needed it. I was conscious time was pushing on and I still had a way to go. As I walked up the main street a bus arrived labelled Fortrose and stopped right by me. I thought this was fate so I got in it and arrived at Fortrose about 10 minutes later. 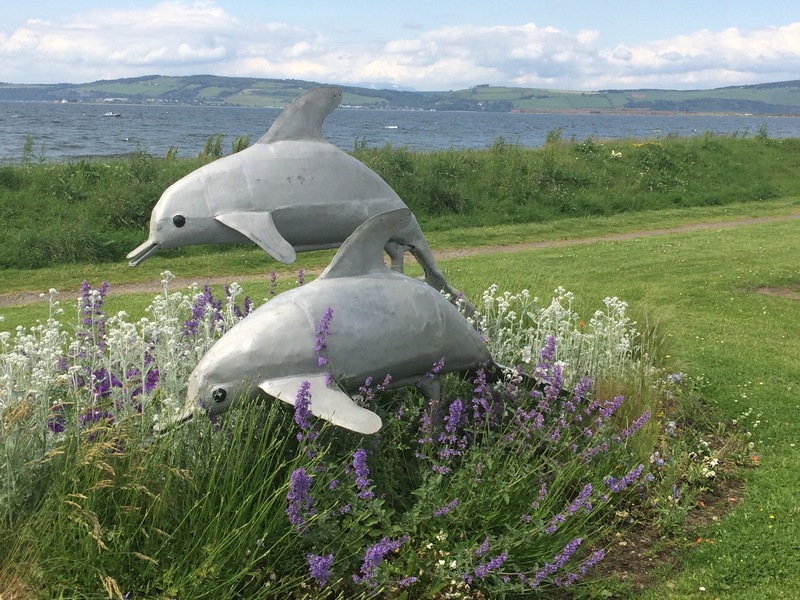 Fortrose is a very small town at the head of the peninsula that leads to Chanonry Point, dolphin-watching territory. Despite its small size it has a ruined cathedral that was built in the 1200s and sacked in the Reformation. It was quite an important place as it housed the Bishop of the Diocese of Ross, which covered a lot of North Scotland, and a ‘town of clergymen’ built around it. I found my campsite, pitched my tent and relaxed in the sunshine for a bit while my washing dried. 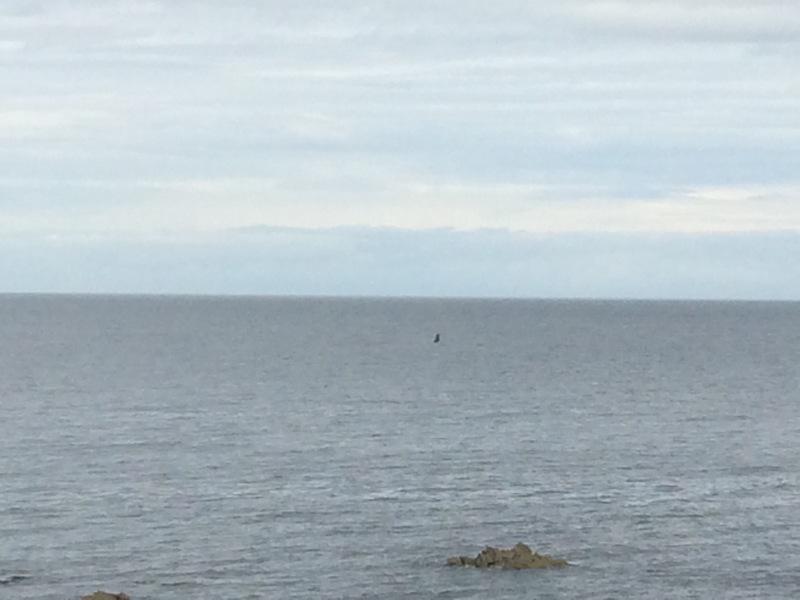 No Dolphins this afternoon as the wind has increased and the Firth has become choppier the last couple of afternoons. The campsite owner booked me into the local restaurant, Eilean Dubh, for dinner as it’s won some awards and is highly recommended. It was definitely worth going; locally sourced food and the best sticky toffee pudding I’ve ever eaten. There was a big thunderstorm during the night that cleared the air a bit. I was up at 4.15 am as Dave was heading to Inverness Airport for an early flight and kindly dropped me off at Ardersier enroute. 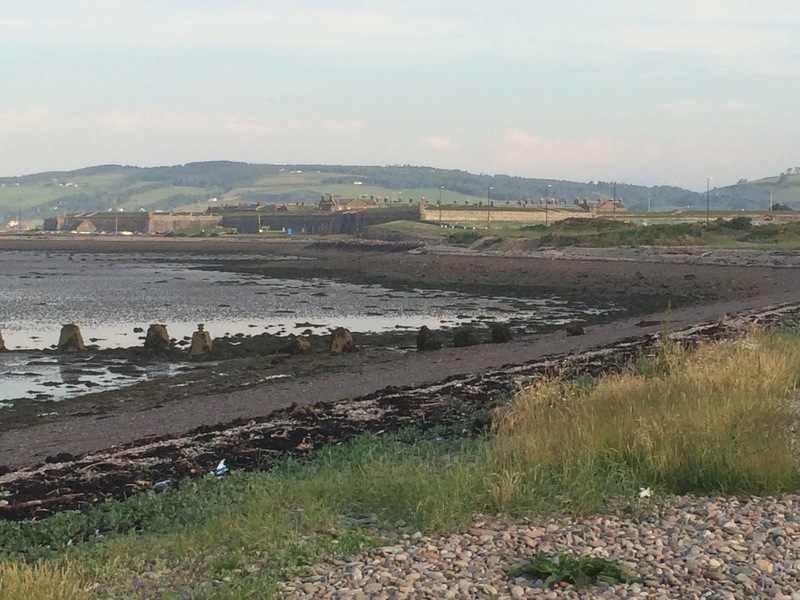 From there it was a 1.5 mile walk along the Inverness estuary to Fort George. 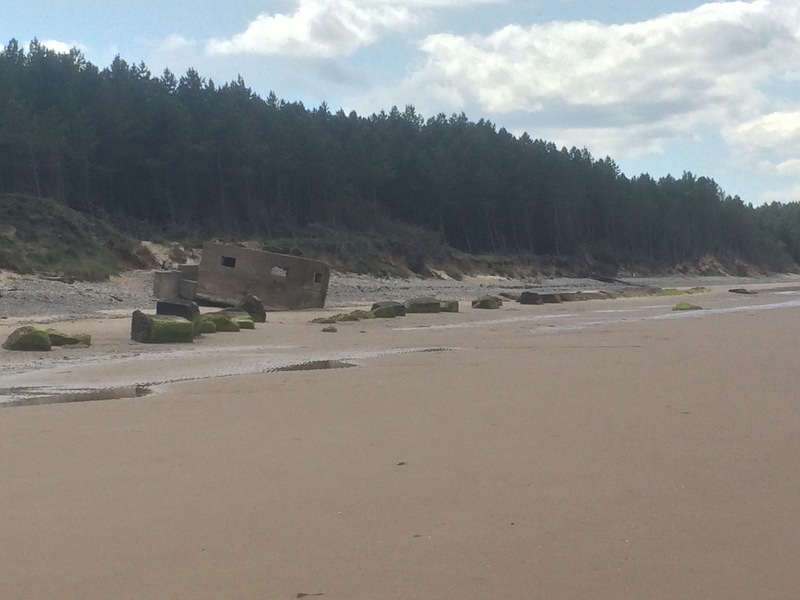 As there are no coastal paths between Findhorn and Inverness I had decided not to bother walking and just to visit Fort George instead as it seemed like an interesting place right on the ‘neck’ of the Moray Firth, directly opposite Chanonry Point. Yet again I had been really lucky and very well looked after by Dave and Cally. 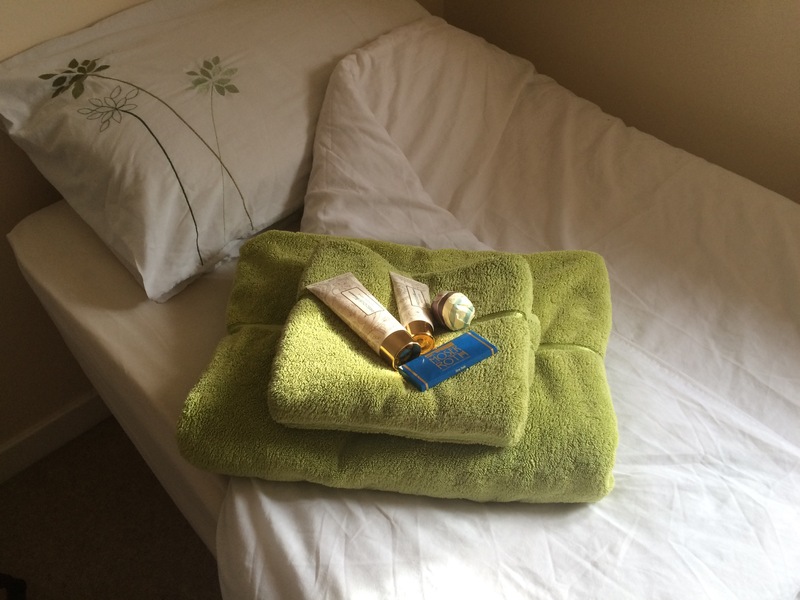 Staying with friends provides a welcome morale boost. It was so quiet and peaceful at 6 am; no one was about, the sky looked huge and the water was dead calm. A great morning for sitting on the rocky shore and watching dolphins. What a treat I was in for, an hour long show. At first I only saw one, very close to the shore, but soon there were lots, in many small groups. It was so calm I could hear them breathe out through their blowholes before I could see them. I was able to watch them for ages and occasionally was treated to breaching and big dives. Fantastic. 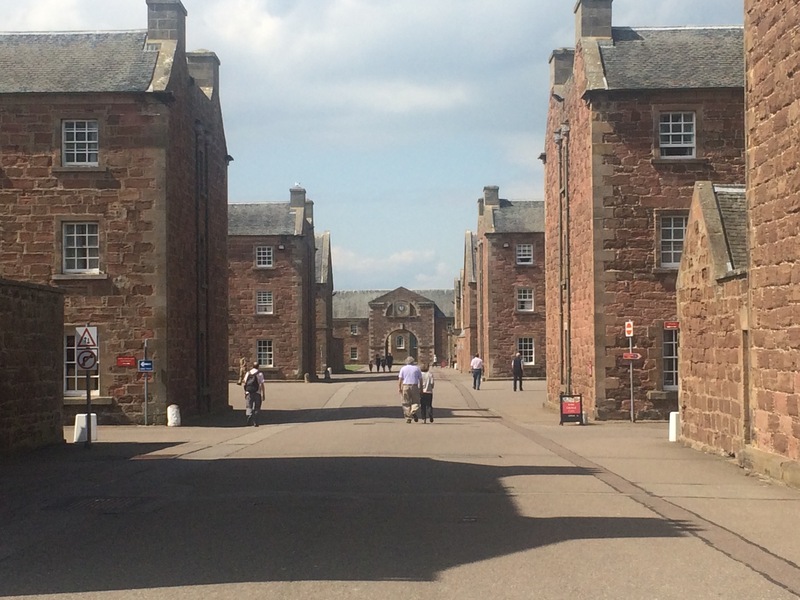 Once the show was over I spent some time enjoying the calm and catching up on blog writing until Fort George opened to the public at 9.30 am. It’s a popular place and there was already a coach in the car park by 9.45. It is the only fort in the country that is open as a museum and is still a working barracks, hence there were soldiers wandering around. The fort is so well preserved and well designed that I’m sure it would have been impregnable in the mid-1700s, it’s just a pity it took over 20 years to build and so was surplus to requirements by the time it was finished in 1770. Nothing ever changes in the military! 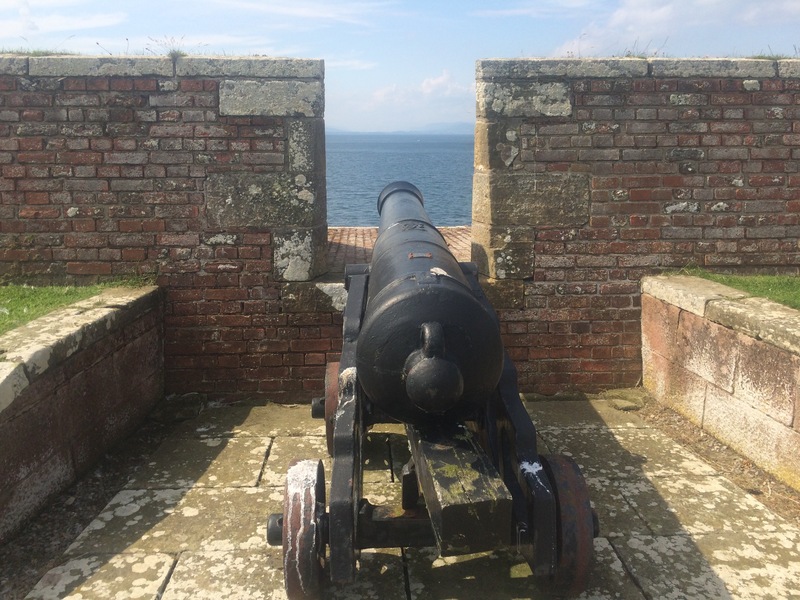 The fort was designed by William Skinner after the Battle of Culloden, which was just a few miles down the road, in 1746. 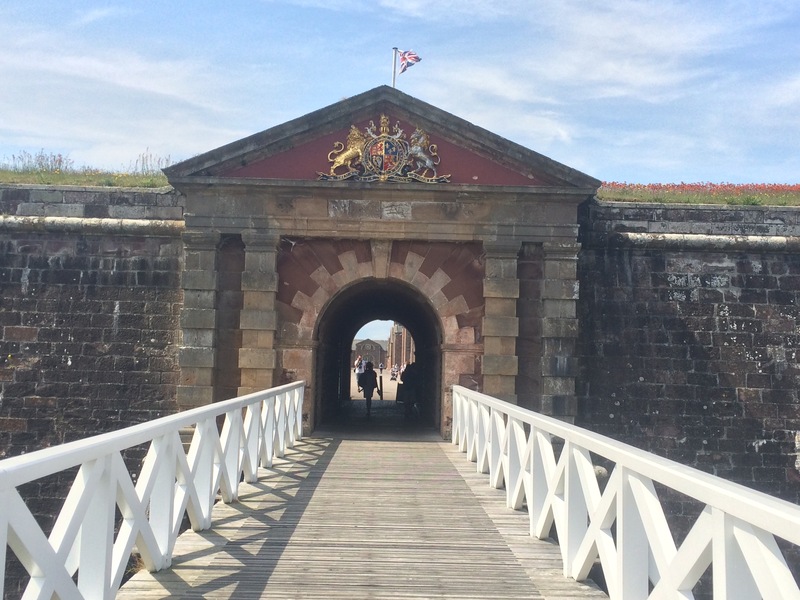 The Crown beat the Rebelling Highlanders and built Fort George to contain any possible future threats from those pesky Scots. By the time it was finished, however, England and Scotland were quite well united. The Highlanders museum and the Seaforth Arms display were both impressive. I spent a good couple of hours wandering around. I went for a coffee and was asked if I was in the Army – I must still have a military look about me! I explained I was in the RAF and I think that still qualified me for a discount. 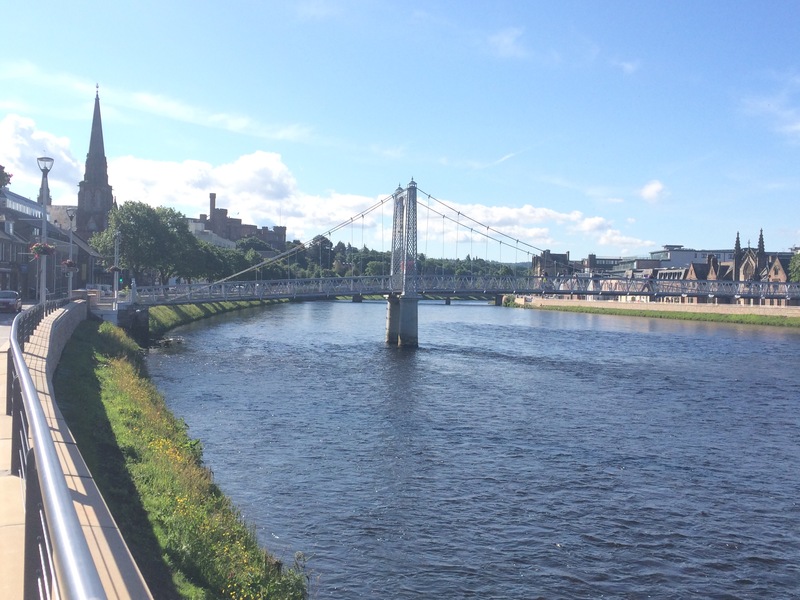 I had to walk back to Ardersier to catch a bus to Inverness in the afternoon. I wandered through the ‘Capital of the Highlands’ and booked into one of the backpackers’ hostels. I think I’m too old to appreciate these sort of places. I needed to go shopping for a couple of things so did a tour of the outdoors-type shops and bought a hat, a tick remover tool and a new t-shirt to replace my one that’s falling apart after 3 months of constant wear. I was feeling a bit glum as planning was going badly so I treated myself to a restaurant meal as I couldn’t face navigating the hostel kitchen. The hottest July day ever recorded in the UK was not one to spend walking. It was scorching hot in Scotland as well as down South so I sheltered from the heat in Elgin. Apart from helping Cally with a dog walk along the beautiful River Lossie estuary I had a lazy day. It was too hot to do anything. A big thanks to Dave and Cally for allowing me to hang around at theirs for an extra day. 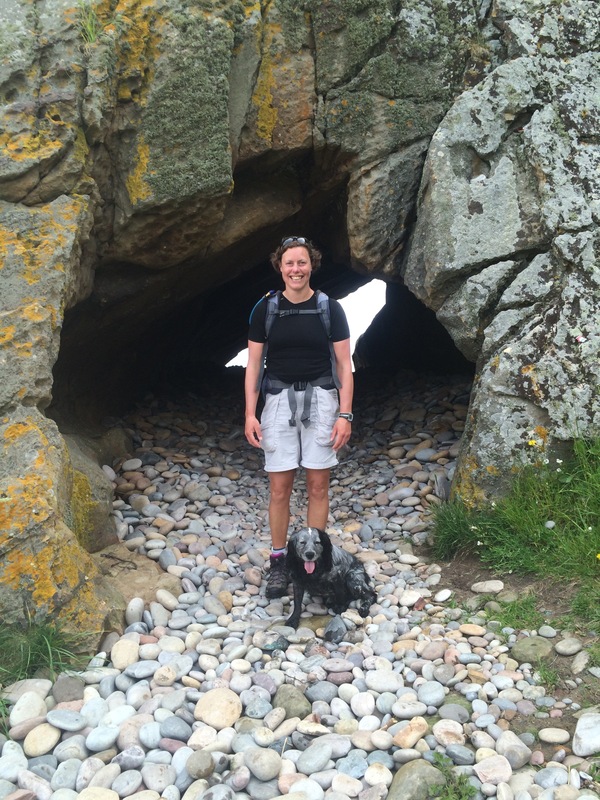 A hot and sunny day was in store and Cally was going to walk the first part with me from Lossiemouth to Hopeman. Dave drove us to have a look at Lossiemouth East Beach, looking beautiful in the morning sun, before dropping us off at the West Beach. Cally walks fast but I managed to keep up and it was nice to have some company. No need for a map when walking with a local! Lossiemouth beach is unusual in having a lighthouse halfway along it just plonked in the dunes. It also has runway lights in the dunes that belong to RAF Lossiemouth and by 10 am we were being serenaded by noisy, but impressive, Typhoons. After about 2.5 miles the beach ran out and the path headed up onto the cliff top. 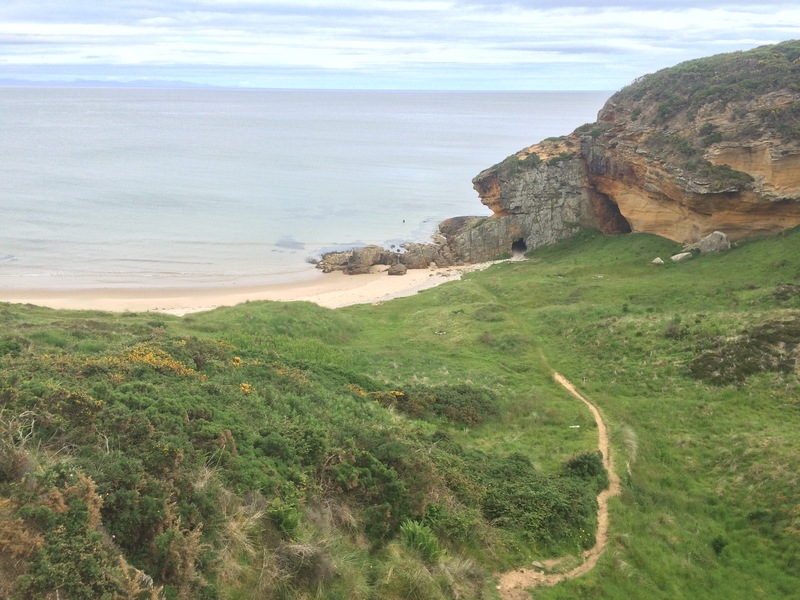 There were a couple of beautiful little coves that looked great for wild camping. The sandstone cliffs are perfect for developing caves and nooks and crannies. We arrived at Hopeman in no time at all and we did walk past the one famous Prieshach hole on the Hopeman links golf course that makes several lists for best hole. 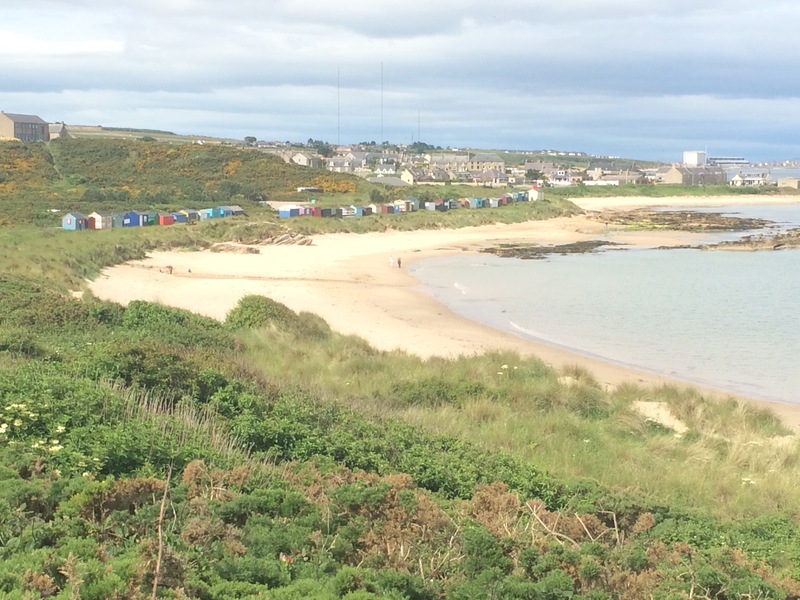 Hopeman is a lovely little town, with a beautiful beach, and the first with beach huts that I’ve seen for ages. Unfortunately Cally had to leave me here to go to work. It was getting hot and I was slower on my own. 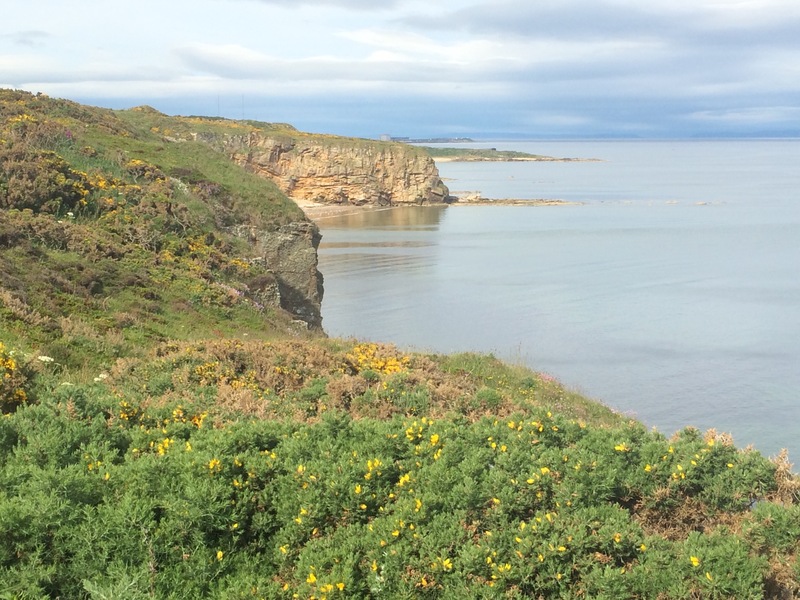 The walk from Hopeman to Burghead was mostly on a cycle track along the disused railway line. I past St Aethan’s Well, complete with dog bowls, but the water didn’t look very clean. 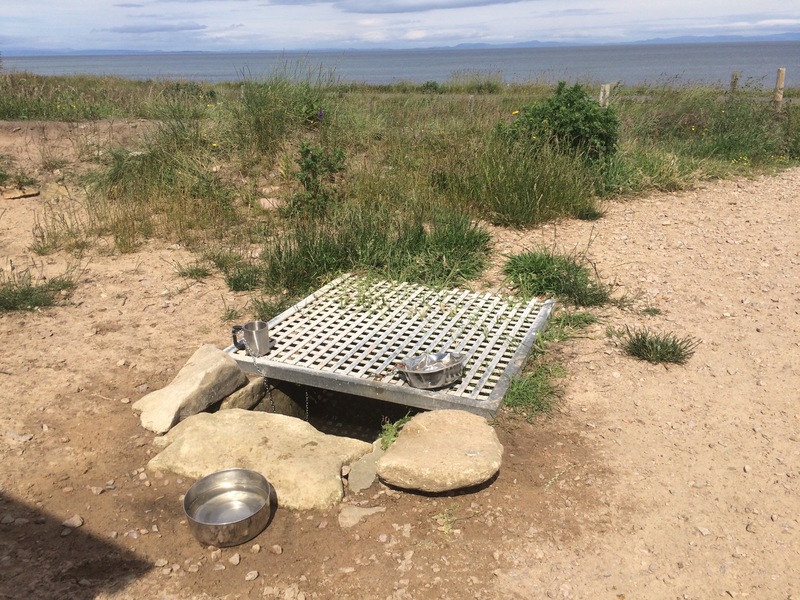 St Aethan’s Well – good for dogs on a hot day! 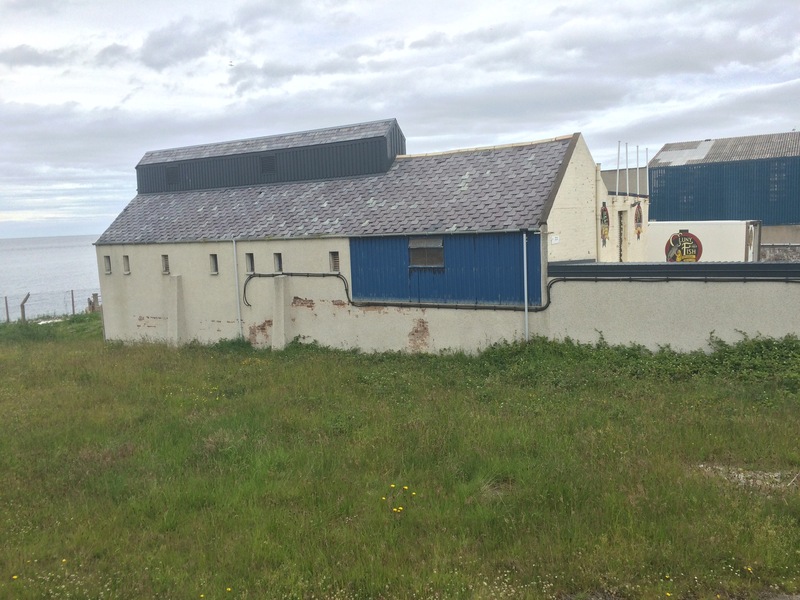 Burghead looks ugly from a distance as it is dominated by a factory on its edge; however, it is built on a promontary and I quite liked it. 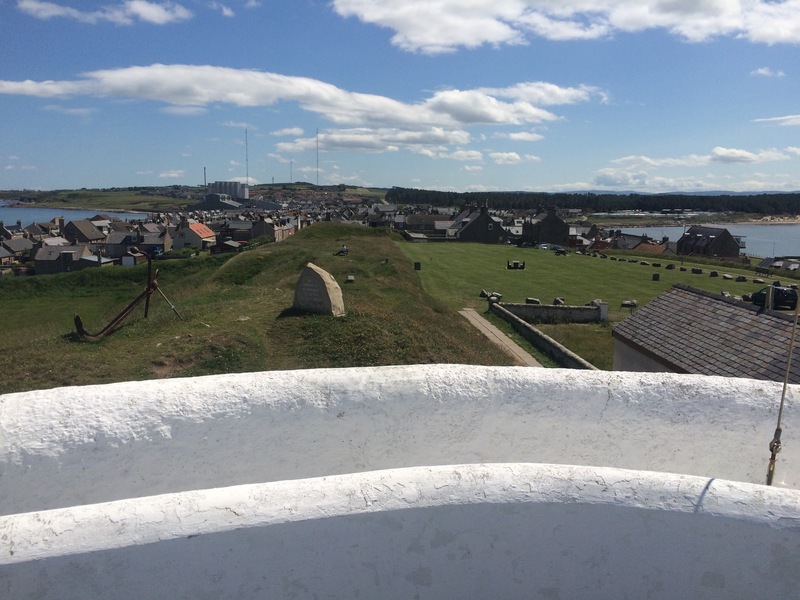 Its natural shape made it ideal for a fort and there is a great little museum about Burghead’s past as a Pictish fort. 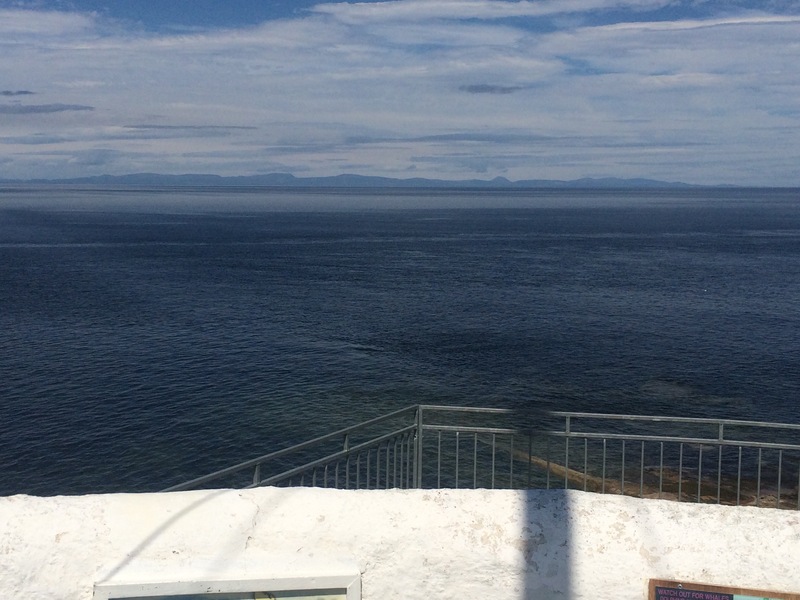 The museum also has a fantastic vantage point from where I could see all across the Moray Firth. Great for dolphin spotting (although I didn’t see any). 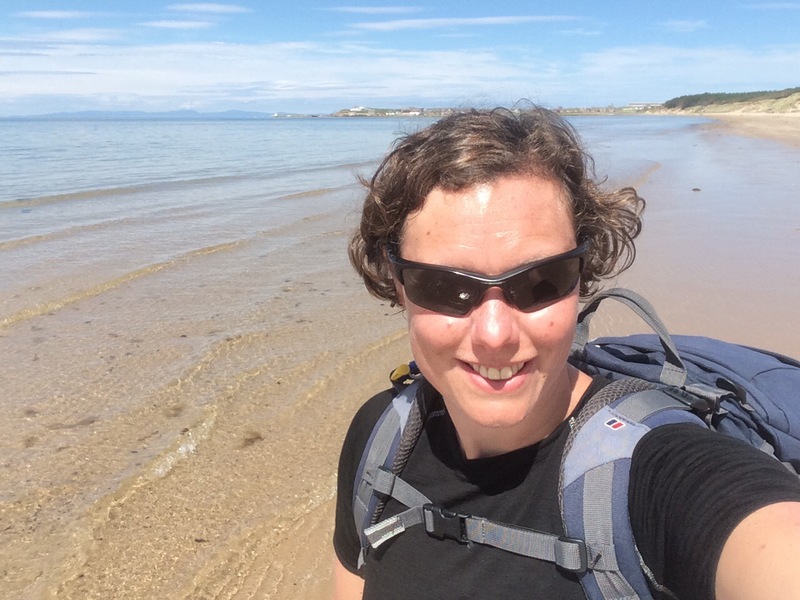 I stopped at The Bothy cafe for a drink and some shade before I began my 7 mile hike along the Roseisle beach to Findhorn. The sun was shining and it was hot so I took my boots off and paddled in the shallows all the way along the beach. Some areas are quite secluded as the beach backs onto a forest. I took the opportunity to strip off and go for a quick skinny dip at one point. The water wasn’t even that cold. 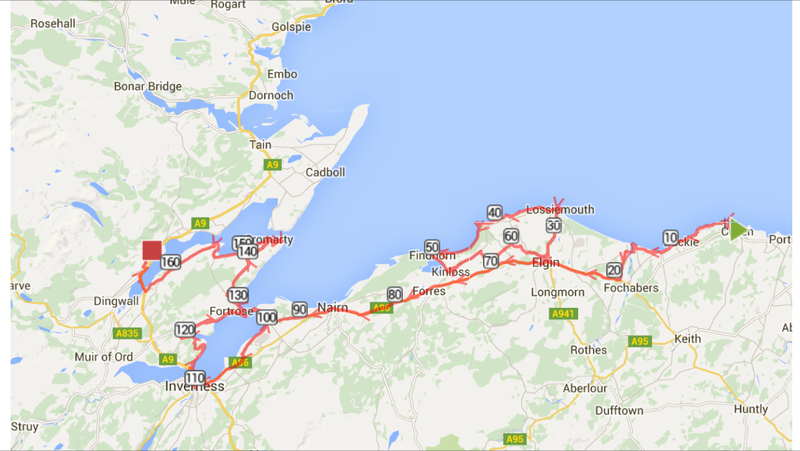 At one point I thought I was never going to reach Findhorn. It is a long way on a hot day. Cally and the kids were there to meet me and there were lots of people on the beach here. 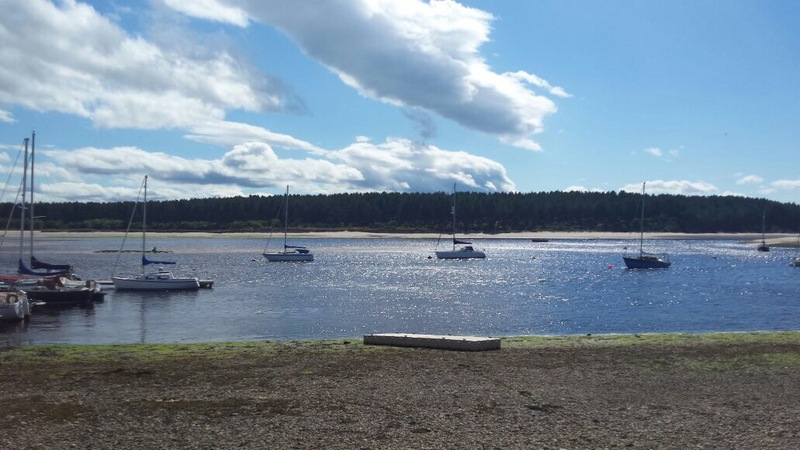 Findhorn Bay is a vast, sheltered basin where the River Findhorn flows to the sea. 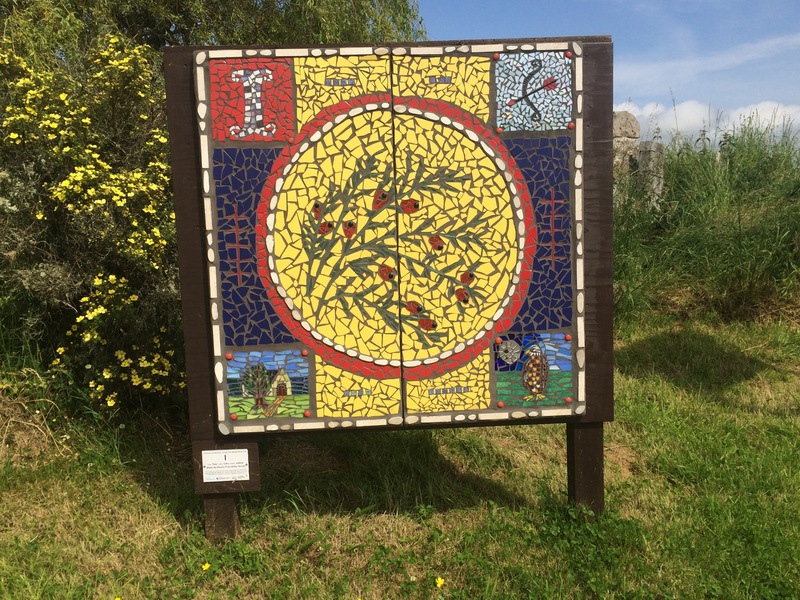 It has the beautiful Culbin Forest on the West side. We stopped at the cafe for a bit of refreshment. 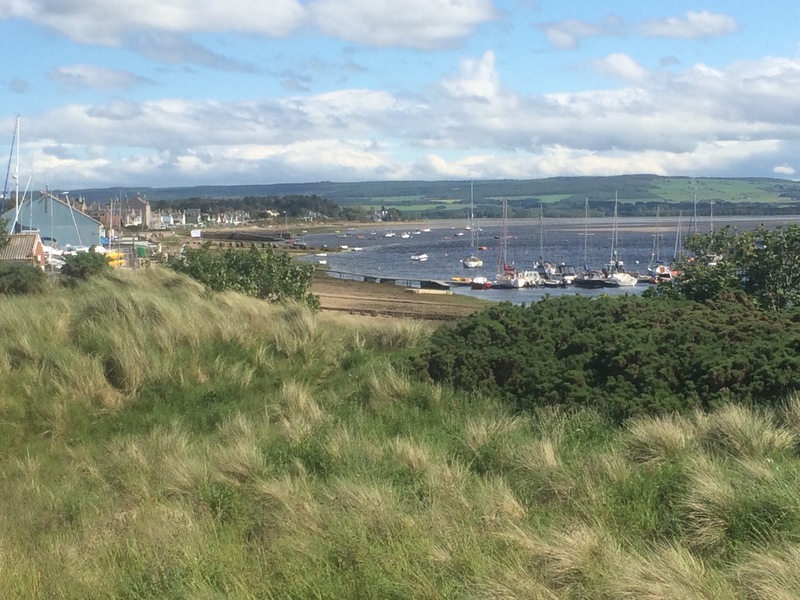 It’s always windy at Findhorn. The tide moves fast in the extensive bay as well. We didn’t see many hippies from the Findhorn Foundation today. It had been a good walk and I had managed to get my feet sunburnt. I was fortunate not to have a hangover this morning. But the sun was shining and it was nice to sit outside the hostel with a cup of tea admiring the view across the harbour. Having left the pub without paying last night I had to walk back up the town, get an envelope and post some money through the letterbox of the Three Kings. Once that was done I could set off, through Seatown and across the Cullen links golf course. 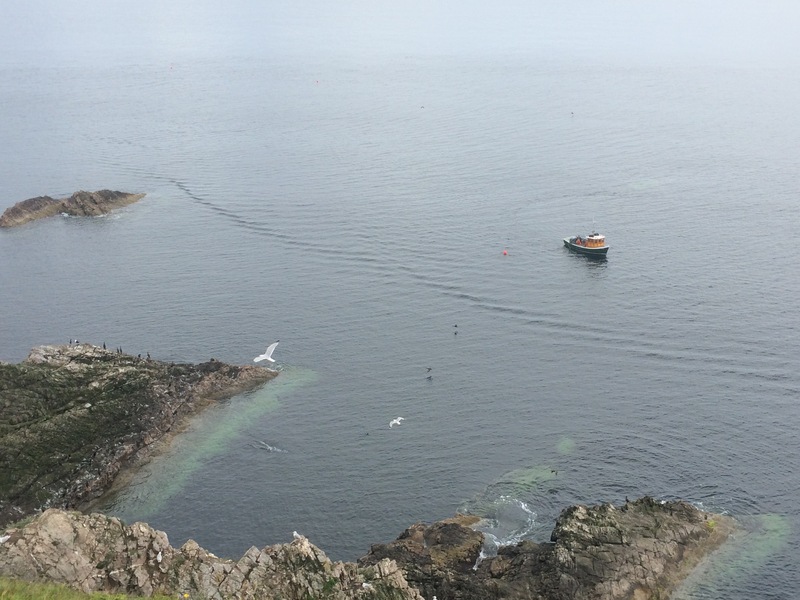 I climbed up the cliff and watched a fishing boat setting creels to catch lobster and crab. 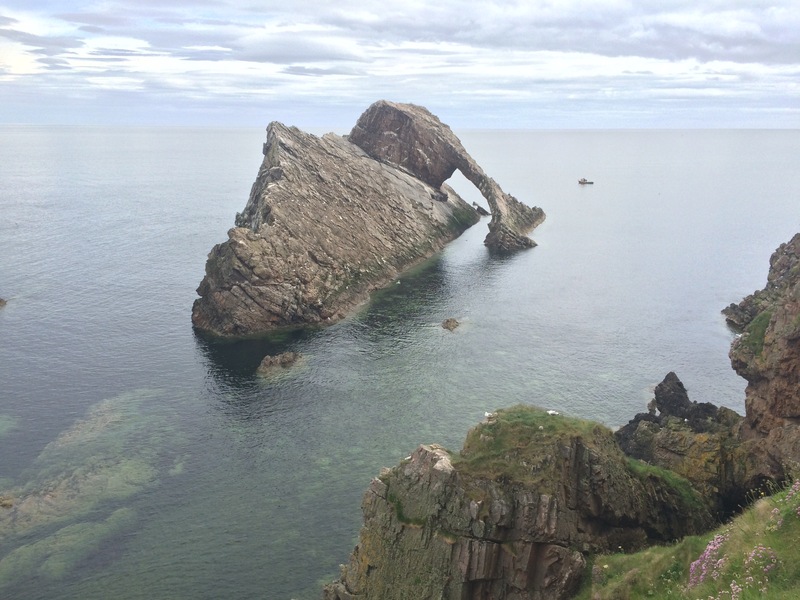 There was a path along the headland and I was able to admire all the amazing rock formations and stacks produced by the deeply folded beds of Cullen quartzite. The best one is Bow Fiddle Rock. Portknockie was the next town, and then Findochty (can be pronounced Finickty). All of these towns are built to the same mould but some, like Findochty, look brighter with their brightly painted houses. I stopped at The Admirals pub for a coffee and to do some blog writing. I ended up staying for a spot of lunch. I had Cullen Skink, a creamy seafood and fish soup with potato and onions. Delicious. I climbed up the cliff again and stopped at the war memorial to admire the view. 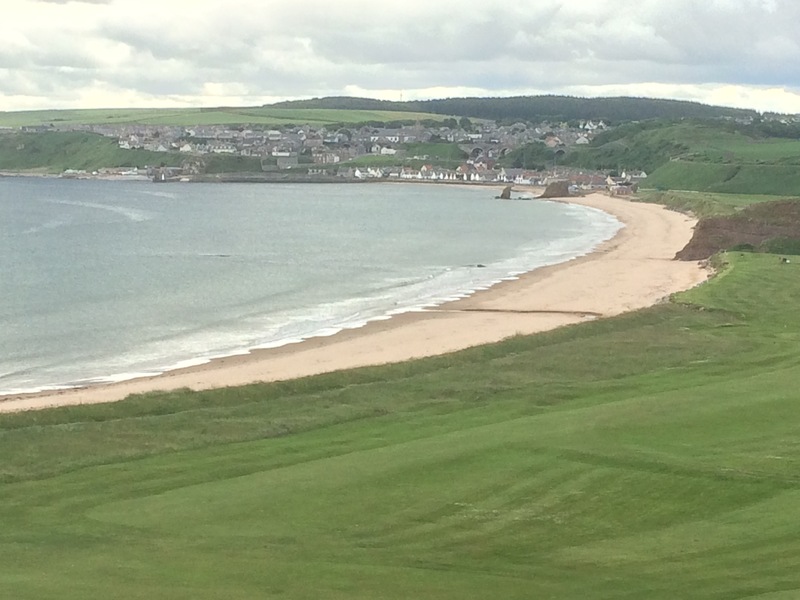 Then it was a walk around yet another golf course and down the hill to Buckie. 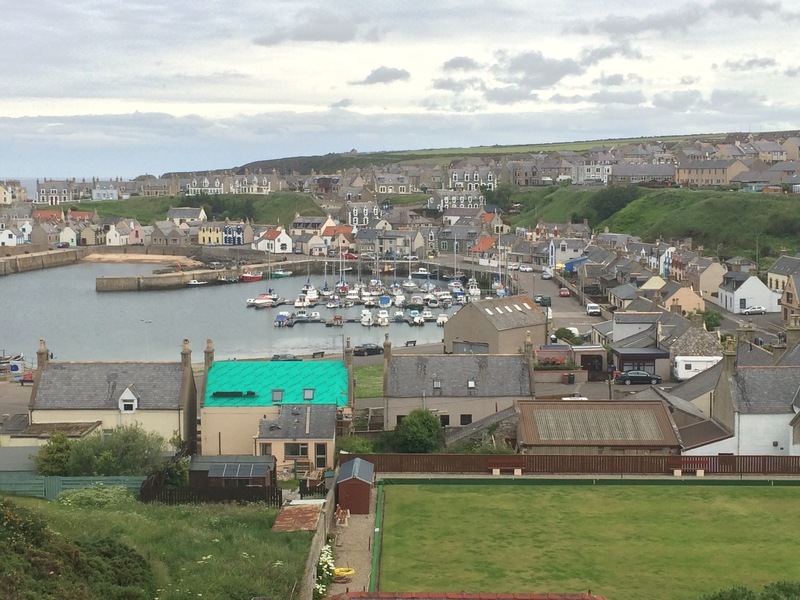 The town of Buckie seems to have swallowed the small towns of Portessie, Ianstown and Gordonsburgh, although all 3 have their own nameplates there is nothing to them. There is a colony of grey seals on Craigenroan Rock just offshore from the old Strathlene lido that is now filled in with stones. 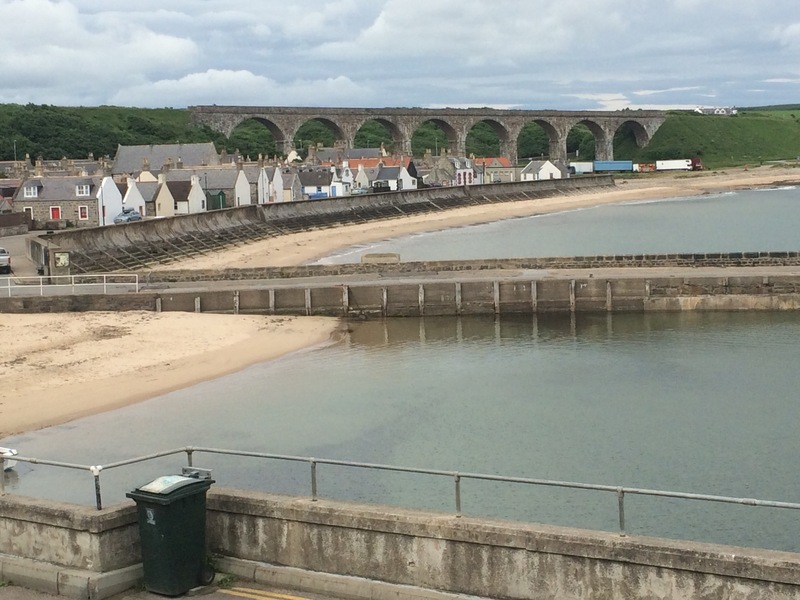 I walked along the Buckie sea front and this town did not have the same feel as the other harbour towns. 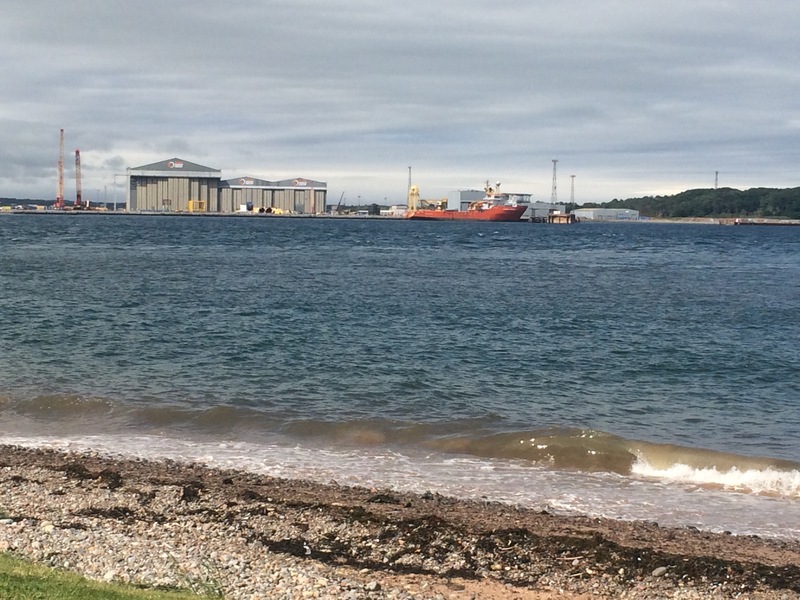 Buckie is bigger and still has a small shipbuilding industry, which used to build the herring fleet trawlers. 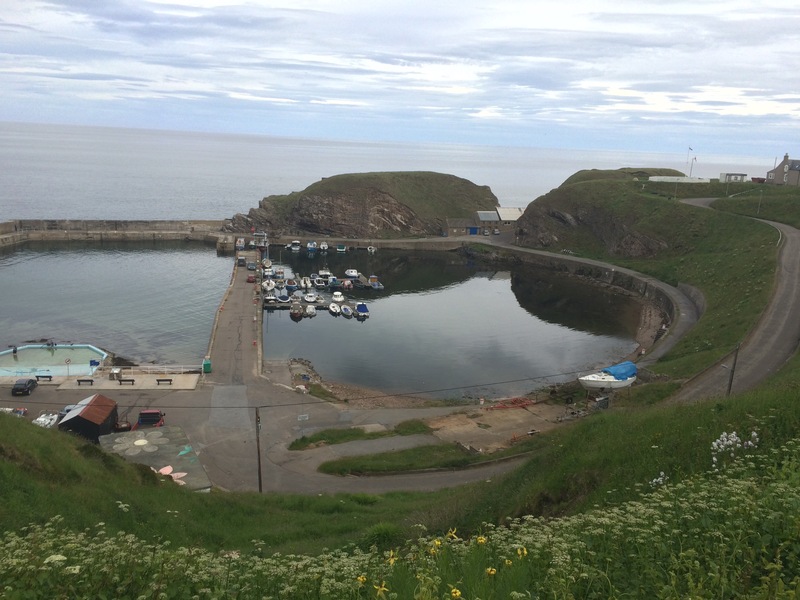 Buckie had a large herring fishing fleet in the early 1900s and the Cluny Fish Kilns are still in operation, smoking fish for over a century. I saw dolphins swimming along not far off shore. I managed to get a photo of one breaching, although it’s not very good without a proper camera. 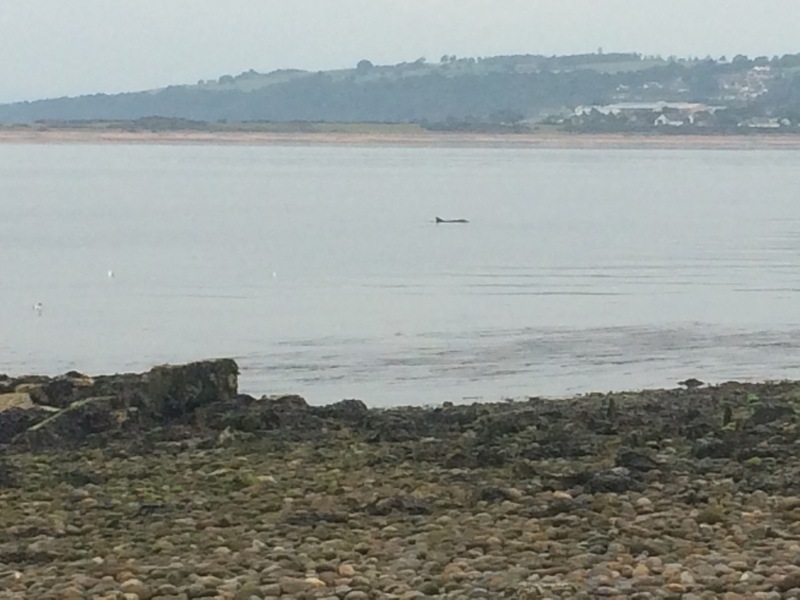 I stood quite some time watching the dolphins and getting talked to by a young lady with incredibly bad teeth (probably from drinking cans of Irn Bru or Monster as I frequently see). Eventually I said I had to go and carried on to Portgordon, which seemed really rundown and there were several houses up for sale. 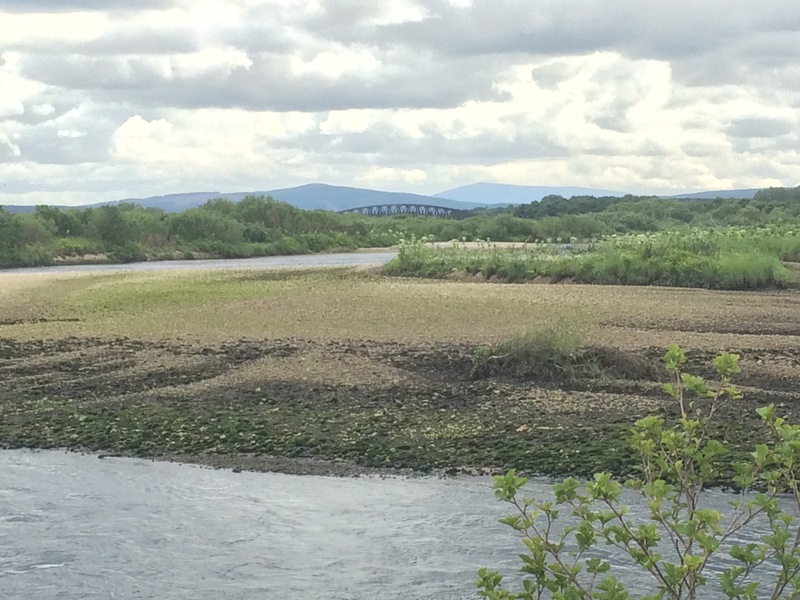 I then headed inland slightly and onto the Speyside Way, a National trail that follows the River Spey, Britain’s fastest flowing river. 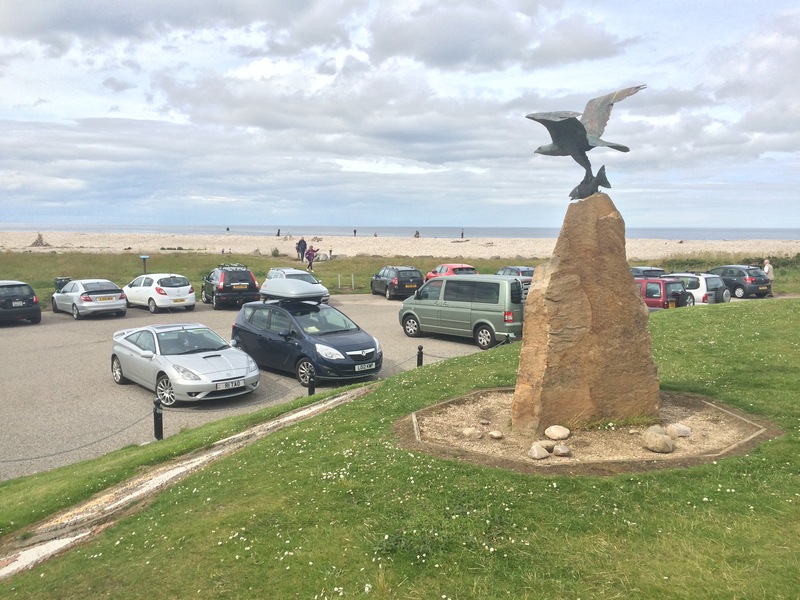 At Spey Bay I stopped to check out the Scottish Dolphin Centre and there were quite a lot of people trying to spot dolphins (I didn’t boast that I’d had a great view of some at Buckie). 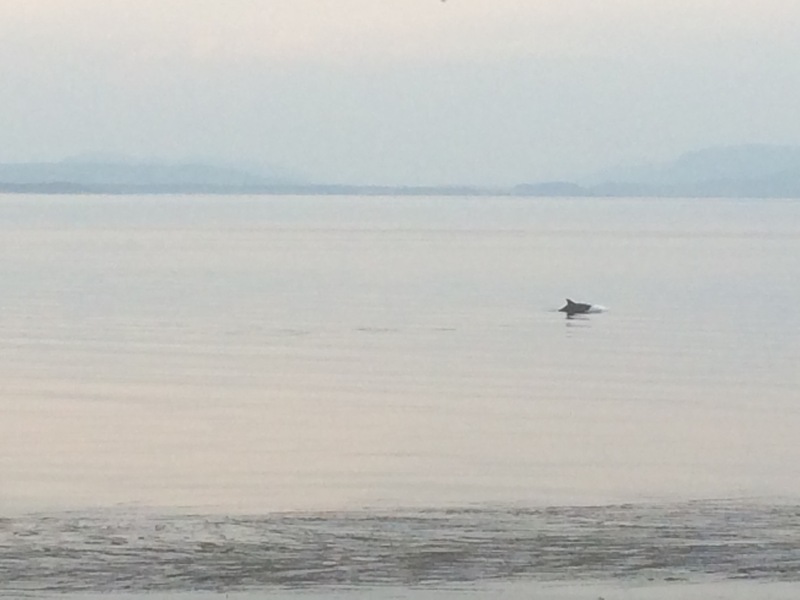 The Moray Firth is home to a pod of almost 200 bottlenose Dolphins and they are significantly larger and fatter than other bottlenoses as this is the farthest North and the coldest sea they are found. 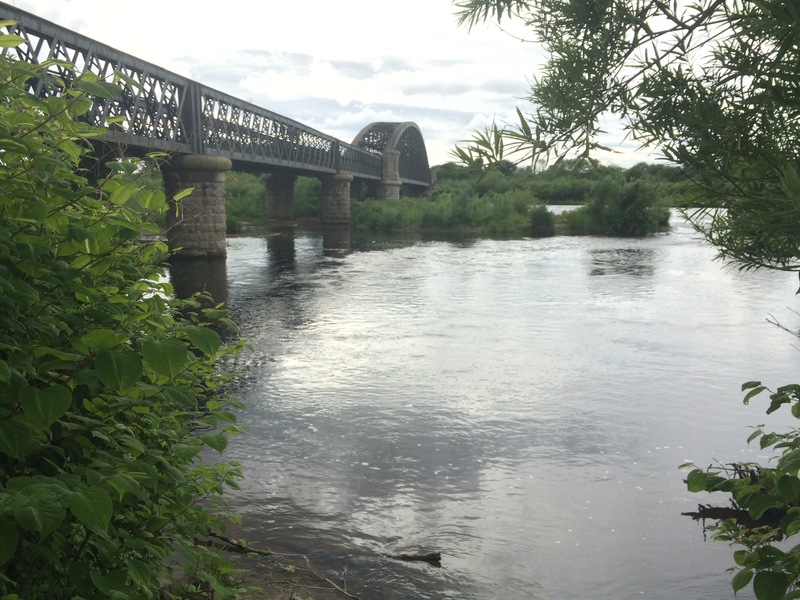 I walked about a mile up the River Spey to the first bridge and crossed it into Garmouth where my friend Dave had agreed to pick me up. From here to Lossiemouth involved a long, and dull walk along shingle next to a forest so I decided to give it a miss. It had been a long enough walk and Dave’s wife, Cally, had cooked a lovely dinner and I was keen to meet the children and answer their questions.